Hello everybody, it’s Ruby again. I hope you are having a lovely week so far. We started the week with our usual check-in and it was nice to hear about everyone’s weeks! We talked about was the 30th anniversary of the World Wide Web on Tuesday. We were shown a video about it and it highlighted the difference between the internet and the World Wide Web. The internet is where computers connect to each other in order to share information, whereas the World Wide Web is where you view websites online. I recently discovered that the founder Sir Tim Berners-Lee is a professor of the Department of Computer Science at Oxford University. Next, we were shown a TED Talks video by Andrew Blum about the physical side of the internet. He talked about visiting the places where the internet physically exists, for example underwater cables, switches and servers which connect us. I thought it was absolutely fascinating. For our homework, we were asked to find out where the data centres for our cloud storages are. I discovered that data centres for Dropbox, which is something that I use are in the USA. The team checked some of our HTML and Scratch homework. One of the team played my Number Guessing Game on Scratch without me telling them how the game works, and were pleased to see it woek. One of the team set me a challenge to add a count block to see how many guesses the user gets whilst playing the game. 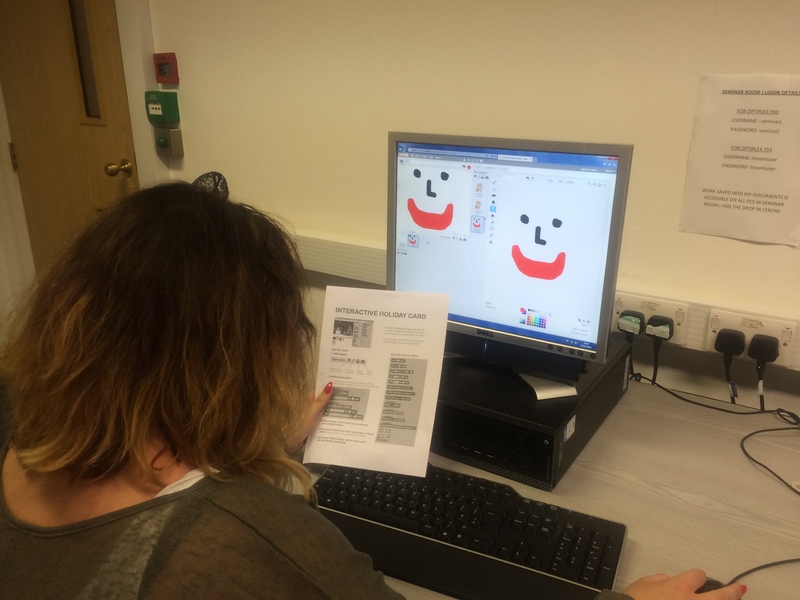 The team also suggested to add sources to the images we’ve used in our HTML image exercise homework. After our 5 minute break, we had a discussion about the projects we will be doing in the next 3 months. It can be a website, a game or an app about a subject we’re interested in. There are five stages of making a project: Requirements, Design, Development, Testing and Implementation. We were also asked to write a speech about the project we are planning to do and why we are passionate about the subject we’ve chosen. I’m excited about doing it and planning it all out! I hope you all had a lovely week so far. We had our usual check-in before we went through our Scratch and HTML exercises homework. There was a choice to do one Scratch exercise and one HTML exercise or do all of the exercises. I’m proud to say that I did all of them. The first Scratch exercise was to move a fish using your arrow keys and adding another fish with a different colour to say, ‘Hello!’. The second Scratch exercise was to write our name using sprites or blocks and to make it interactive by changing colours or making a sound. There were three HTML exercises. The first one was to write the squares of the numbers 1-20. Each number was to be on a separate line, next to it the number 2 superscripted with an equal sign and a result e.g. 5²=25. I also had to write 10 names with a line break between each one. The list was to be alphabetised and to do this, I had to place a subscripted number next to each name based on where it would go on the alphabetised list e.g. Kate₉. First, I wrote a unalphabetised list and then the alphabetised list. I gave both lists a <h1> heading. The second exercise was to create links to different search engines and create a page with a link at the bottom of it that when clicked would jump to the top of the page. The third exercise was to show 5 different images, skipping two lines between each image. I gave each image a title. I also had to display an image that when clicked, would go to the link of the search engine of my choice. I chose Google. We sent our HTML homework through email. The team showed what we did and they were all impressed with our work. We were each given a challenge to do. Mine was to make each letter move in my ‘Name’ Scratch project. 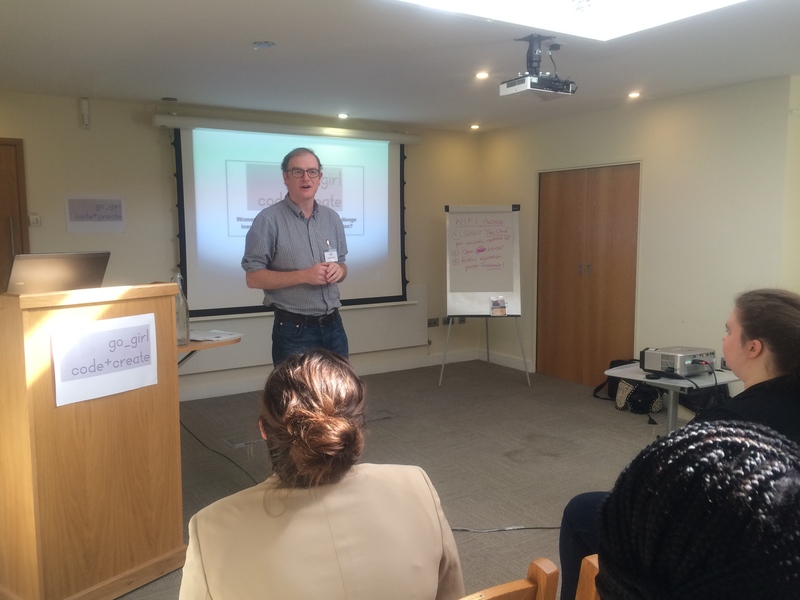 Next, we were shown a TED Talks video by Julian Treasure about how to speak to make people listen. After the video ended, we moved outside as it was a warm and lovely day. On Tuesday 26th, it was Ashmita’s birthday. We celebrated with chocolate cake! We had a discussion on our thoughts about the video. I thought it was interesting. I learned that we need to use less of the ‘Seven Deadly Sins’ of speaking: Gossip, Judging, Negativity, Complaining, Excuses, Exaggeration and Dogmatism. To make people listen to us, we would use Honesty, Authenticity, Integrity and Love. We also had a discussion about how we would structure a presentation or a speech. One of the Go Girls said her way of structuring a speech or a presentation would be Point, Evidence and Explanation. I shared my experiences of doing presentations in the past. I have felt nervous before doing them, but once I did them, I felt relaxed. At the end of the session, we were given homework to write a speech or create a presentation about a subject which interests us. I’m looking forward to the next session and I’ll see you on another blog post! Hello everybody, it’s Ruby again. I hope you all had a lovely week so far. We had our usual check-in before we went through our homework which was to write an HTML page about our role models in the STEM sector. I chose Joy Foster because she has always been supportive of what I’ve wanted to do and that has motivated me to keep going. In my page, I included color, font and image tags. We sent our HTML pages through email. The team showed what we did and they were impressed with our homework – I did feel proud of what I had accomplished! One of the girls had some errors with her HTML page and I was able to help her out with debugging her code to get it working correctly. It’s nice to be able to work in a group and help and learn from one another. After we had our 5 minute break, we started to use Scratch. I said in my previous post that the last time I used Scratch was at secondary school. It is a visual programming site. You can drag and drop whereas HTML is text based. After I created my Scratch account, we were given a task to produce an interactive card. I started doing a birthday card for my brother and I used a sprite called Ruby, a birthday cake and I made a table for the cake to rest on. It was fun to make. At the end of the session, we were given homework which is to do Scratch and HTML exercises. We will be doing Scratch again next week and I’m looking forward to it. Hello everyone, it’s Ruby again. I hope you all had a good week so far. We went to a different room as there was a lecture going on in our usual room, which was interesting as we got to see a different part of the Department of Education at the University. Monday 11th was International Day of Women and Girls In Science. The team discussed who their female role models were in the sector and why they were their role models, and challenged us to think about who are role models could be. We were given homework last week which was to write an HTML page about our safer internet pledges. I shared my HTML page about turning off chat heads from Facebook Messenger and my digital detox. We had a recap on what we learnt about HTML last week. We created an HTML page containing each letter of our names in a different colour. I had R in red, U in purple, B in Blue and Y in Yellow. Then, we made another page writing each character of ‘GOGIRL2019’ in different heading sizes. Initially, I had a debug in the ‘I’ part. It showed the forward slash, h4 and the closing bracket. I fixed this by adding the opening bracket. We tried to see how far the heading sizes would go. I learnt that ‘h7’ is how far it can go. We also changed each letter of ‘GOGIRL’ to a different font. At the end of the session, we were given homework to do. It is to write a paragraph about our female role model in STEM and why. We will use the tags we learnt and a tag that the class hasn’t covered yet. I will be using the IMG tag for mine. Next week, we will use Scratch. It is a free programming language and online community where you can create your own stories, games or animation. I used it before in ICT at secondary school. Hi everybody, it’s Ruby again. I hope you’ve had a good week so far. We had our usual check-in with 2 new visitors. They were there to see what Go Girl is about and the fun we have. This Tuesday was Safer Internet Day. We had a discussion about how to stay safe online, for example using privacy settings and never giving out your personal details publicly on the internet. 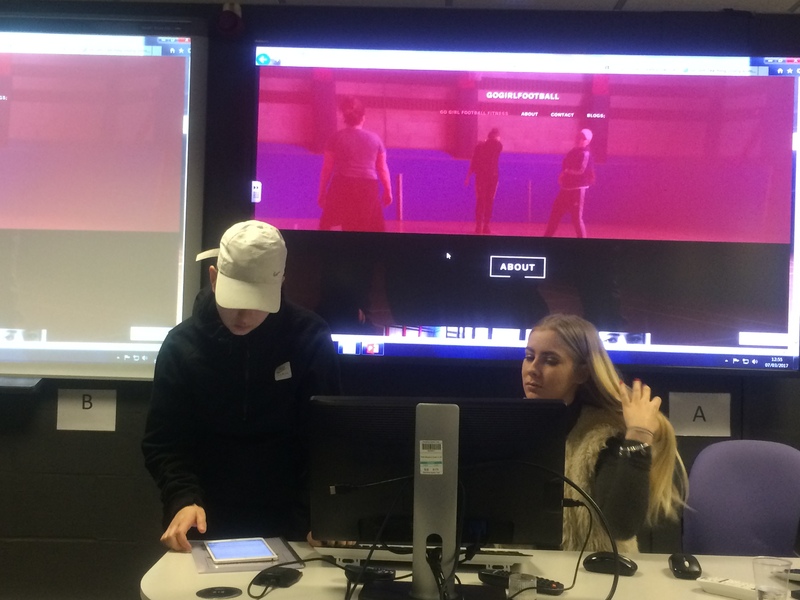 We were shown a video that UK Safer Internet Centre had made about consent (Which you can view in the link below). We discussed our own experiences with staying safe online, especially when using social media sites. Afterwards, we were asked about what we would do to stay safe online more. Mine would be to do a digital detox for the whole weekend and switch off chat heads from Messenger. We wrote them down and shared what they were. We had a 5 minute break and sang some songs, which was a great way to relax and get to know about the girls’ interests! We were asked about the difference between blogs and websites. Blogs is about writing or sharing what you’re views whereas a website is a series of pages, images and text. I discovered an easy way which you can view seeing a back-end of a web page or site. You right click ‘View page source’ to see the HTML and CSS of the page and how it functions. There are elements which are represented in different colours. The blue element represents hyperlinks, purple represents HTML tags (To help structure the page.) Head represents the title of your HTML document and body represents the text of what you’re writing. We were asked what HTML stands for. It is Hyper Text Mark-Up Language.The purpose of HTML is to create the basic elements for a webpage. We started to do HTML using a text editor called Notepad. I learnt that if you write something without using HTML on Notepad, it will appear exactly the same way you made the document. If you want your Notepad document to appear as a webpage, write it in HTML and change the file name from txt to html. Then, you can view it on a web browser of your choice. At the end of the session, we were given homework to write an HTML page about how we can protect ourselves more about being safe online. I enjoyed the session. I have done a bit of HTML and CSS in the past using sites like Codecademy. As some of you may know, I want to do some web designing/developing in the future. I’m looking forward to revising more HTML next week and I’ll see you on another blog post! Session 9: Pseudocode success and a game to think about budgeting! Welcome back everyone! It’s been quite the week in Oxford so far. We’ve experienced our first snowfall, which was beautiful to see and distracted us oh so briefly from the planning for this week’s session! We decided to switch gears this week , and pivot from Pseudocode and HTML to some lessons in finance. Not before checking in on the girls’ homework though! After our weekly check-in we went through the homework problems set to challenge the Go_Girls while at home. We dicussed the solutions that the girls had come to, and happy to report success on all counts! 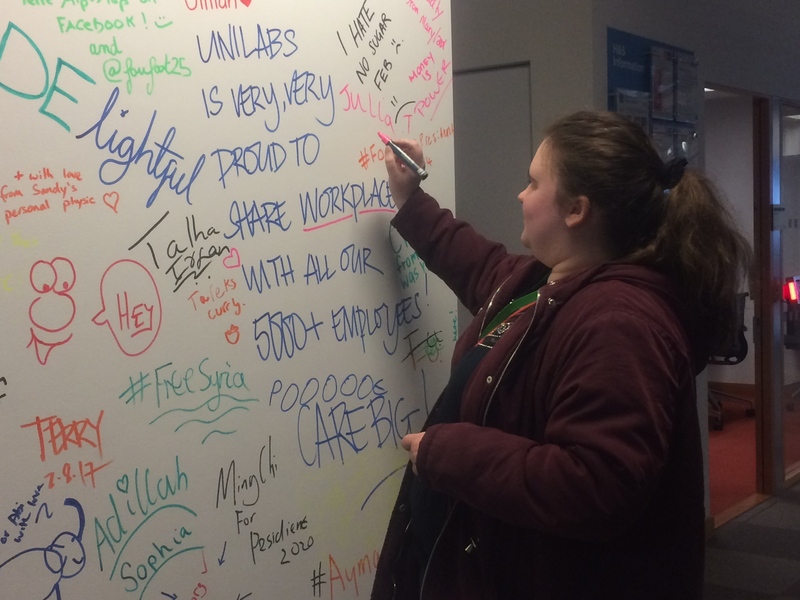 It was great to see the different approaches to the same problem – a fantastic opportunity for the young women to see how creative coders can be, and how each coder can almost have their own unique signature on the piece of code that they write! 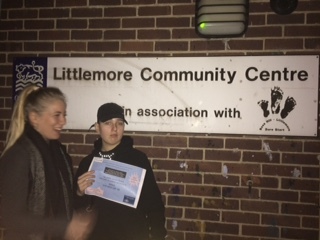 After a well-earned break, our young women played a great game that our new youth worker Abisola (read her bio here), had found on the excellent resource put together on the Barclays Life Skills website . The game provided the young women with a set amount of money that they had each month, and then took them through various choices of debit, credit and life events as the young women rolled their way around the board. We covered wide ranging topics from what saving can look like, payday loans, and challenged the young women to think about how they would make choices with money. It turned out to be quite competitive game as the young women worked to be the one with the most saving by the end of the month, providing some entertaininment while being highly informative along the way. We will pick back up next week with another session on finance – see you next week! Session 6: WHILE loops and some Xmas fun! We’ve finished our last Go Girl session before the Christmas holidays yesterday. The Go Girl team gave us a Christmas card and a bag of Celebrations each. First, we had our usual check-in before we did a recap of Pseudocode and using the WHILE condition or loop in our programs. We wrote a WHILE condition for one of the programs that we’ve created. I included a WHILE loop for my ‘MakingMarmiteOnCrumpet’ program. We practised WHILE conditions for printing out numbers. I initially found using the WHILE condition in my programs hard, but I’m now finding it easier. At the end of the session, we were given homework to do during the Christmas holidays. It was my birthday last Thursday and the Go Girl team gave me a birthday card and a chocolate cake which was lovely. After the session, we all walked down to Nando’s at The Westgate Centre. I had 2 Portobello mushrooms and halloumi wraps with extra-mild spiced chicken breast burger and chips. It was delicious! Go Girl will be back on Wednesday 9th January. I hope all of you have a very merry Christmas and a Happy New Year! Hello everybody, it’s Ruby again. We’ve just finished our session for this week. We had sandwiches, crisps and salad for lunch. It was delicious! First, we had a check-in about what we’ve been up to and the challenges we’ve faced in the last week. Every healthy relationship is based on respect, equity and communication. We learnt that to have a healthy relationship you have to let people be themselves, accept them for who they are, respect their opinions and not pressuring them to do something they don’t want to do. Always be honest and say what you and mean what you say. Unhealthy relationships can happen due to being complicated or having a lack of respect. 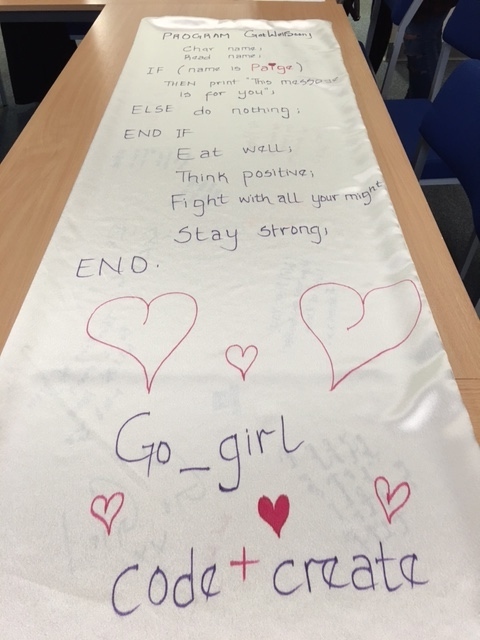 Some of the Go Girls shared their stories about experiencing unhealthy relationships to and it was helpful to share our stories from one another and learn how each of dealt with different issues. The most important message was to feel good about ourselves as well as others. This session was insightful – It was a fascinating topic to discuss. 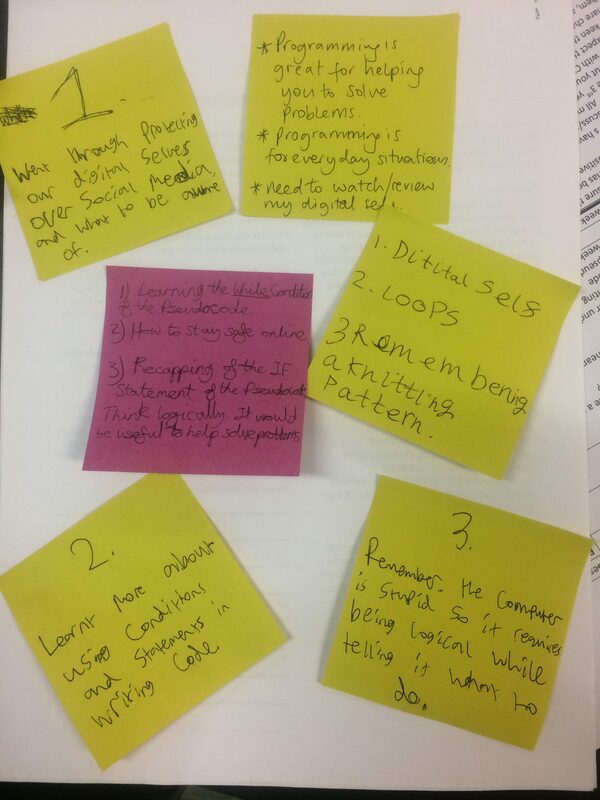 For our last task, we wrote about what makes us feel good about ourselves on post-it notes. One of the things I wrote was people respecting me for who I am. After the next Go Girl session, we will go out for a Christmas dinner. I’m looking forward to it. Today was all about protecting our digital self and staying safe online, and about mastering pseudocode. It was amazing to see how daily activities – like making a Marmite sandwich – can be broken down into individual steps using statements, loops, and conditions, and writing entire programmes with it. We look forward to continuing the fun next week! Hello, it’s Ruby again. We’ve finished our session for this week and I had a great time. First, we had Domino’s pizza for lunch and it was delicious! Next, we had a recap about what we learnt last week. It was fun going over our tasks using the concepts of coding to stack cups and coming up with dance moves. 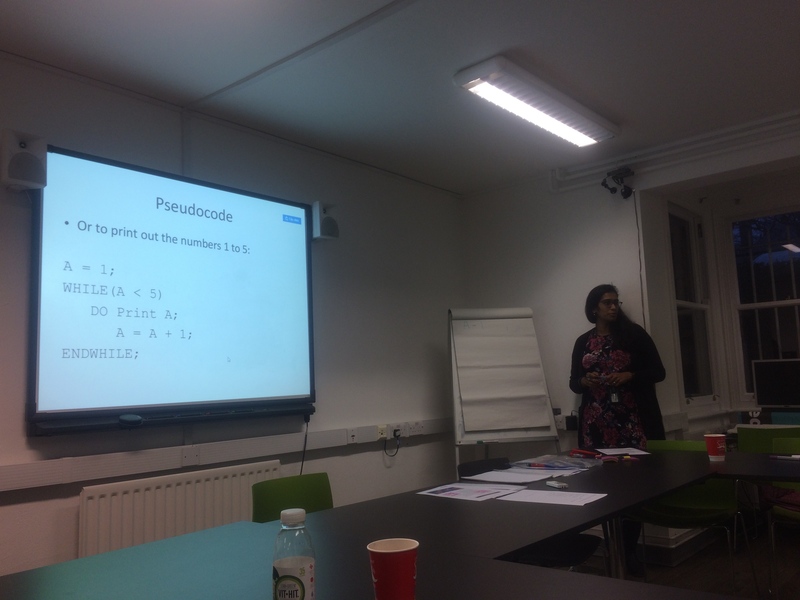 Afterwards, we had a introduction to Pseudocode. It is a description of what a computer programme or a algorithm must do and it’s usually expressed in formal language rather than programming language. Our first activity was to write Pseudo-codes for simple everyday tasks e.g. making a toast for breakfast. After we finished the first exercise, we wrote another Pseudocode, but with IF statements. It is a programming conditional statement that, if proved true, performs a function or displays information. I enjoyed learning about and writing Pseudo-codes. In our next session, we’ll be learning about loops. I’m looking forward to our next session in December and I hope to see you on another blog post! Hello, my name is Ruby P. and I’m new to the Go Girl project. I’m a guest blogger for today. We’ve just finished our first session and it was fun. I got to meet all the girls who are also taking part in the project. Before the session, a few of us went to job fair at the BlackBird Leys Tech Campus. It was a great experience to meet people and talk to them about about the Go_Girl program. First, we folded one paper into half. On one side, we wrote our name and on the other side, we wrote a word beginning with the letter of our names which described us. I was Respectful Ruby. Afterwards, all of us were split into pairs and Colleen came up with 5 questions each. I would write down my partner’s answers and she would write down mine. Questions included our favourite food, the most random food we’ve had, what our dream job would be, a charity or a cause we are passionate about and a thing that annoys us the most and what we could do to sort it out. It was fascinating that many of us have a charity or a cause that we are passionate about. We went through some important group rules before we finished the session. I’m looking forward to doing some coding next week, and I’ll see you all again on another blog post! Session 1: Go_Girl is back! This week we had our first 2018/19 Go_Girl session – a Meet and Greet for our new cohort of young women. Staff members had an opportunity to introduce themselves and share a bit about their personal journeys and our new Go_Girls shared some of their goals and interests with us. Some are keen to develop web design skills building on previous experiences gained in courses on HTML and CSS from Code Academy. Others are interested in photography and creating apps to make life easier while also working to get GCSEs and progress to A-levels. It was a real pleasure getting to know the young women and we are looking forward to working with them and helping them to create their desired projects and plan pathways for transition into education, employment, training or volunteer work. 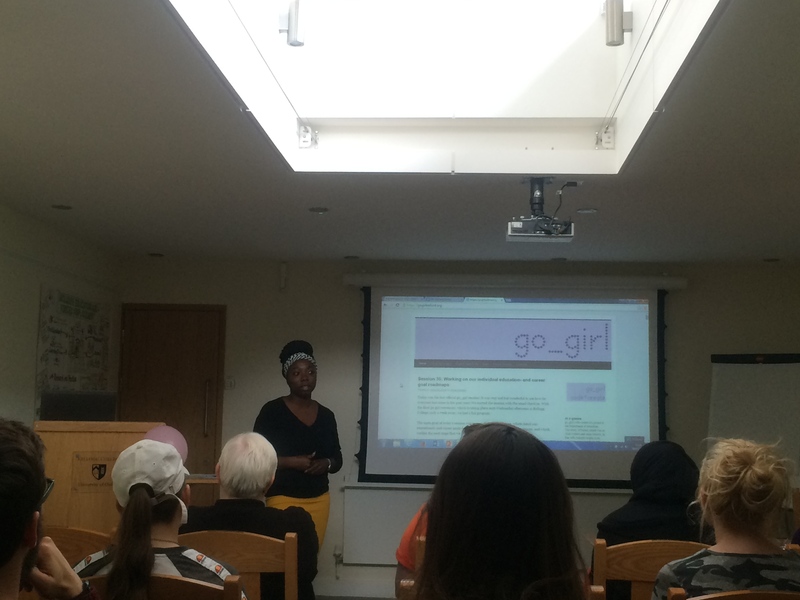 If you’re not familiar with the Go_Girl Code+Create programme, check out our video at https://gogirloxford.org/2016/09/15/1175/ and keep checking our blog site for regular updates. Countdown to the first 2018/19 Go_Girl session! This week Go_Girl staff members met to discuss plans for Go_Girl 3.0. We are thrilled to be able to offer the programme for a third year and we are happy to welcome Colleen, our new Project Officer. The team had a lively discussion about our plans to make this year’s Go_Girl programme even more exciting and beneficial to the new cohort of young women. We will have guest speakers, planned outings, fun goal setting activities and, of course, exciting and creative coding sessions. We’re also really lucky to have some of the Go_Girls from last year returning to support and mentor the new group. Our first session will be starting soon, so stay tuned to our blog for updates. It’s going to be a great year! As we start to prepare for our third cohort of Go_Girl, we’ve spent the last few weeks catching up some of the young women from our last cohort as they embark on their journeys post Go_Girl. 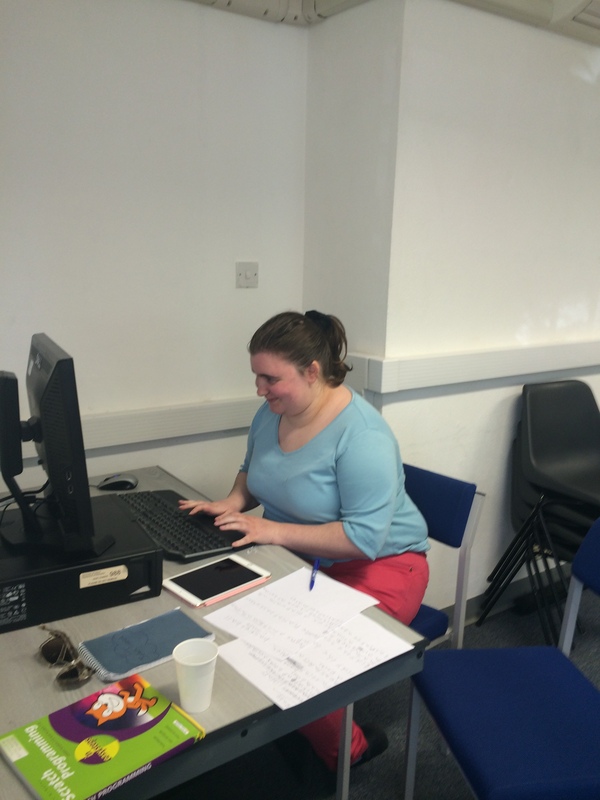 This week we caught up with Rebecca, who is embarking on a new course today! Join us in wishing her luck as she starts an NVQ3 in Business at college in Oxford. Not only is she challenging herself with a new course, she plans on coming back to support us in our work with Go_Girl as a peer mentor for the new cohort, which we are really looking forward to! Rebecca has used the time with Go_Girl exploring her interests, and is looking to go off to university in 2 years. We can’t wait to see what the future lies in store for Rebecca! Tracey and I were delighted to be invited to a workshop at the IET, hosted by the Micro:bit Educational Foundation, to discuss gender inequality in digital and computing education. In just a couple of years the micro:bit has become a global phenomenon, and is now utilised by communities in 50 different countries around the world. Back in 2016 this handheld, fully programmable computer was given to every single 11 year old in the UK. It comes in packs like this one below, and can be coded to perform all kinds of tasks, games and activities. What the micro:bit team have come to realise, however, is that in order to realise their ambitions of enabling every child to create their best digital future some groups of young people may need extra support. Data published this January by the Department for Education showed that in comparison to 4.5 per cent of males, only 0.4 per cent of females taking A-levels chose computer science in 2017. A 2016 World Economic Forum report argued that unless gender inequality in the technology industry is addressed, then gendered pay and power gaps will only deepen as the sector continues to grow. It is important to remember that this is not just a technical issue, but a social problem that we are facing here. With that in mind, micro:bit convened a room full of diverse female experts in technology, education and gender to discuss how to engage more young women in their work and shape not only the future of the tool itself, but also the supportive environment around it. After introductions, the day kicked off with a roundtable discussion where we were all able to share our top three points on the barriers and enablers for girls in coding and making. This proved to be a very lively and engaging debate, with ideas flying across the room and lots of laughter. The points raised roughly fell into four categories – ‘Technology’, ‘Messages and Resources’, ‘Communities and Peers’ and ‘Sector Leadership and Partnership’. After a lunch break, we moved onto forming smaller working groups to explore solutions and strategies that micro:bit could take up within these four themes. At all times it was necessary to remember the key groups that micro:bit, and other educational technology initiatives, need to be thinking and connecting with. Tracey and I were keen to ensure that the needs of girls without access to technology resources, or indeed without strong support systems, were acknowledged throughout the discussions. It was really encouraging to hear that this is also a priority issue for many of the other female influencers in the room. 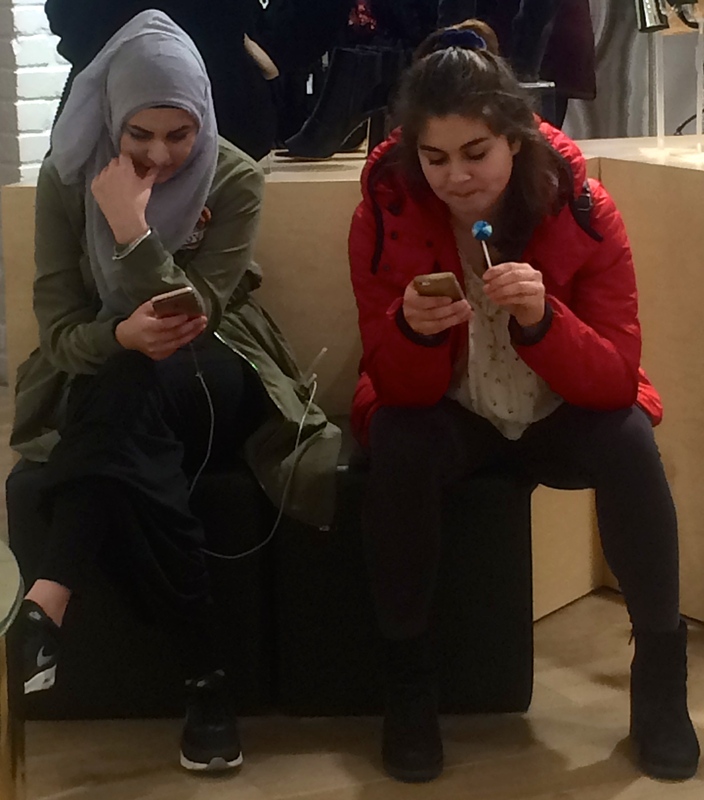 Connecting up with key contacts in disadvantaged young women’s lives, in particular youth and community workers, is vital. It was also suggested that the micro:bit packs could come with a complementary handheld device that can be used to write the code that powers the device, as not all young people have access to computers or smartphones. Over all the day instilled in me a great amount of optimism for the future. It was exciting to be in a room of such inspiring female experts all striving to shape our technological future into one that is accessible to all. We are looking forward to seeing how micro:bit takes on board the feedback generated today, and will be exploring how this device could play a role in Go_Girl 3.0. Many thanks to the micro:bit team for this great experience! After our reunion with the young women from last year’s cohort, we have started to recruite this year’s participants. We are thrilled that the Go_Girl project will re-start its weekly sessions in the Autumn with a new cohort of young women and can’t wait to meet them! Over the summer we came up with lots of new ideas for coding activities and look forward to sharing them with the young women. We are delighted that Colleen, who came along to the reunion last week, will be joining the team this year as our new youth worker and project officer. Welcome Colleen! 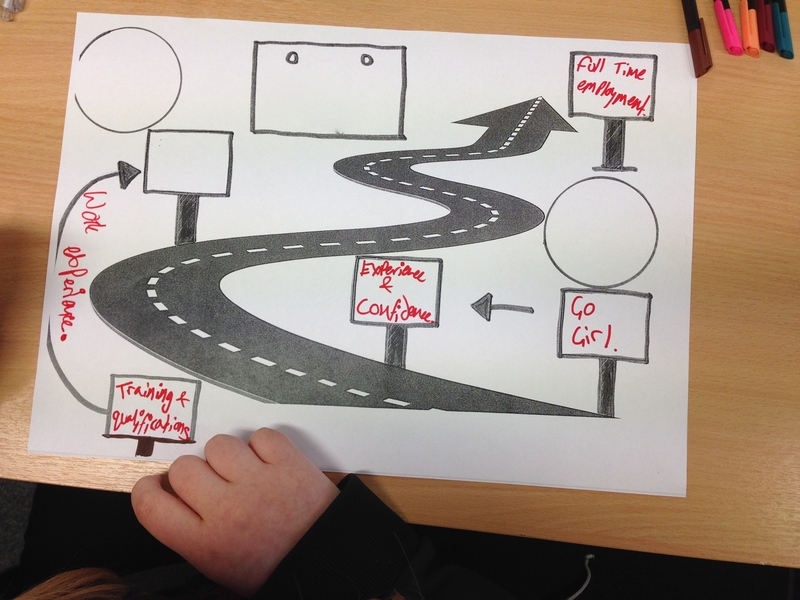 Having successfully completed Go_Girl a few weeks ago, the young women are now embarking on their own journeys, following their individual ‘road maps’ which they have crafted together with the team over the course of the programme. 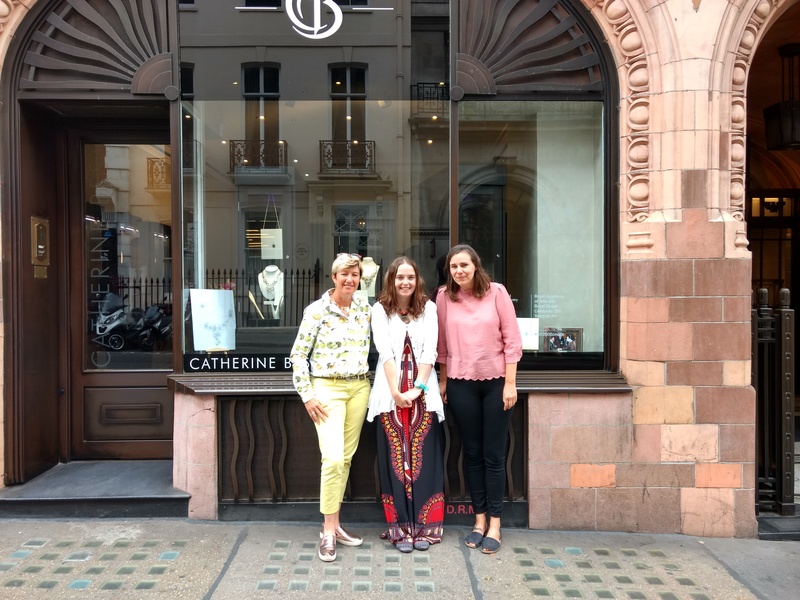 Today, Go_Girl project participant and freelance designer/animator JJ met with the acclaimed jewellery designer Catherine Best. Asked about her day and what she had learnt, JJ said: “It’s been a great day! It’s not always about being the best, it’s about building relationships and being a positive influence on one another.” Thank you, Cathy for your inspirational guidance and mentorship! JJ, we look forward to seeing where your journey will lead you next! After months of hard work, learning (and fun, of course!) the Go_Girl Awards Ceremony had finally arrived! This evening would give us a chance to celebrate all of the achievements that the girls have made over the past year, and hear about their amazing final projects! A very happy occasion indeed! The evening kicked off with an inspiring speech from Melanie Jewell, Oxfordshire County Council youth worker and unofficial Go_Girl Queen ❤ Mel’s journey to where she is today is incredibly moving and a real triumph over adversity – there was hardly a dry eye left in the house after she’d finished her story, and paid tribute to the accomplishments of this year’s Go_Girl group. The Go_Girl project would be nothing without Mel and all of her hard work! Then we were onto the girls’ own presentations. The build-up to this moment had been rather nerve-filled for many, but all of the young women conquered their nerves and delivered powerful speeches to the packed room. Lots of friends, family and other supporters had turned out to cheer the girls on! 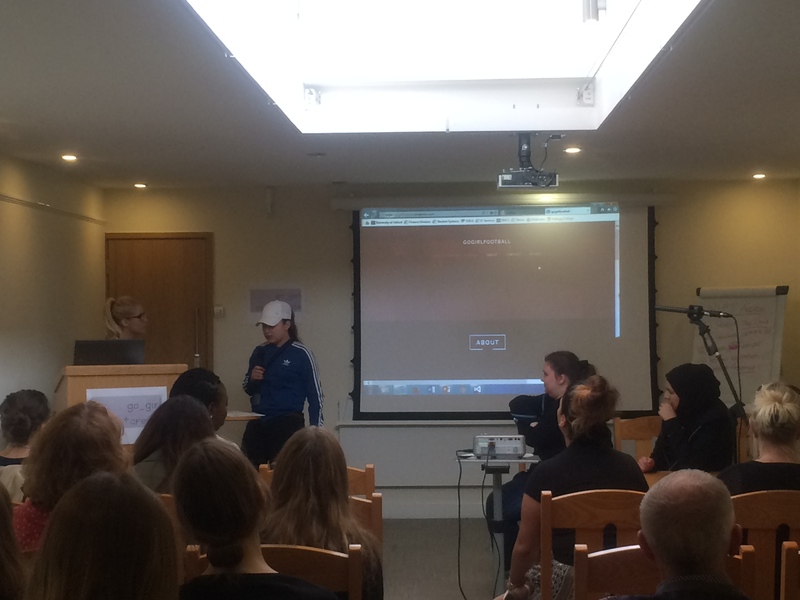 The Go_Girls bravely shared the motivation for their projects, which included their own experiences with mental health difficulties. One of the Go_Girls had created a game where players can defeat different mental health ‘monsters’, as seen above. A team of two Go_Girls had also created a website to raise awareness of domestic violence, an issue very close to their hearts. Another Go_Girl had created a game to raise awareness of animal protection issues. The game enabled people to learn more about different dog breeds. The very cute pictures of dogs got more then a few ‘Awwwws’ from the audience! 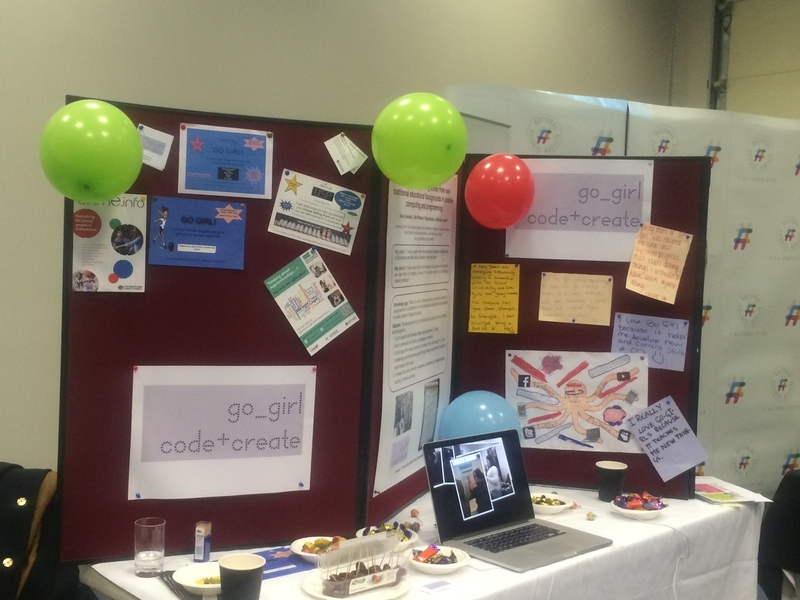 The hard work that all of the Go_Girls have put into their projects was palpable – a wide variety of IT skills have been learnt over the past year in order to make their plans a reality. 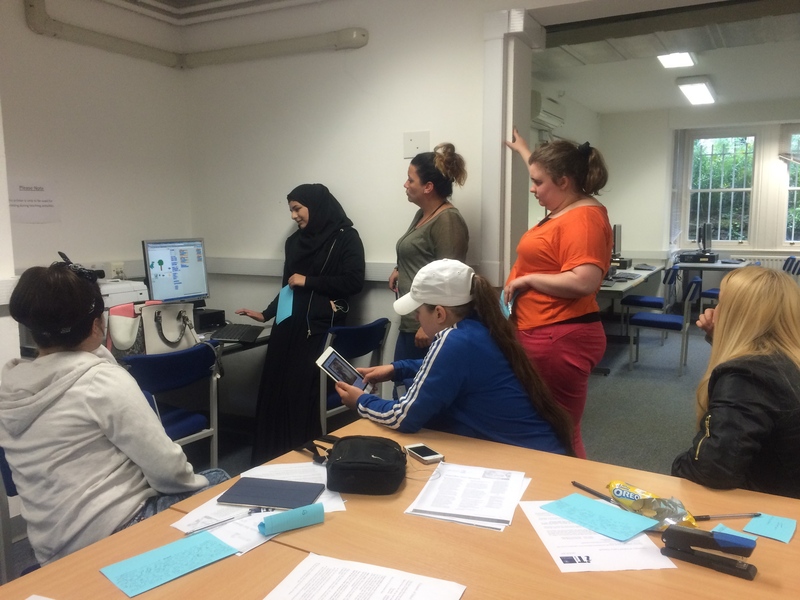 Some of the young women had put CSS and HTML into practice in order to build websites, whilst others had learnt how to use app prototyping programmes. 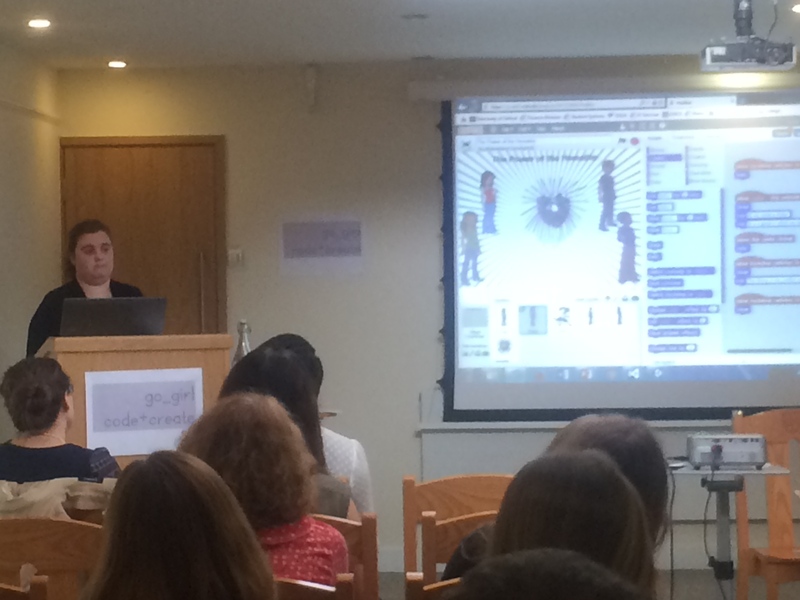 One Go_girl had mastered Unity in order to build a fantastic game featuring her own self-designed animations. Following the presentations the Go_Girls were invited back on stage to receive their awards. It’s been a fantastic year, and the awards are very well deserved. We can’t wait to see what the future holds for these amazing young women, and it has been a privilege to work alongside them the past year. Next time, we’ll be showcasing Julia’s work- Julia’s project fuses her knitting skills with her newly acquired understanding of HTML. Intrigued? Tune into our next blog post to find out more! At the beginning of the month the world celebrated Autism Awareness Day. Autism is a topic of great importance to the Go_Girl team, especially due to the fact that a number of the Go_Girls identify as autistic. Today we were lucky to have some presentations from the Go_Girl group about autism, neurodiversity and what it is like to be autistic. There are around 700,000 people on the autistic spectrum in the UK, which is more than 1 in 100 of the population. It is so important that awareness is raised so that the world knows more about the positive aspects of autism, as well as what can be done to support those experiencing it. Autism is very individual, and varies hugely between different people. No two autistic people are alike, but that is not represented enough in mainstream media. In particular, the group was amazed to learn that girls with autism largely ‘fly under the radar’ and remain undiagnosed for far longer than boys. This is an issue of great importance, because without a diagnosis it is difficult to access extra support. For example, autistic young women are prone to developing eating disorders as a way of controlling the confusing world around them. However, the link between autism and eating disorders is only just starting to be recognised. 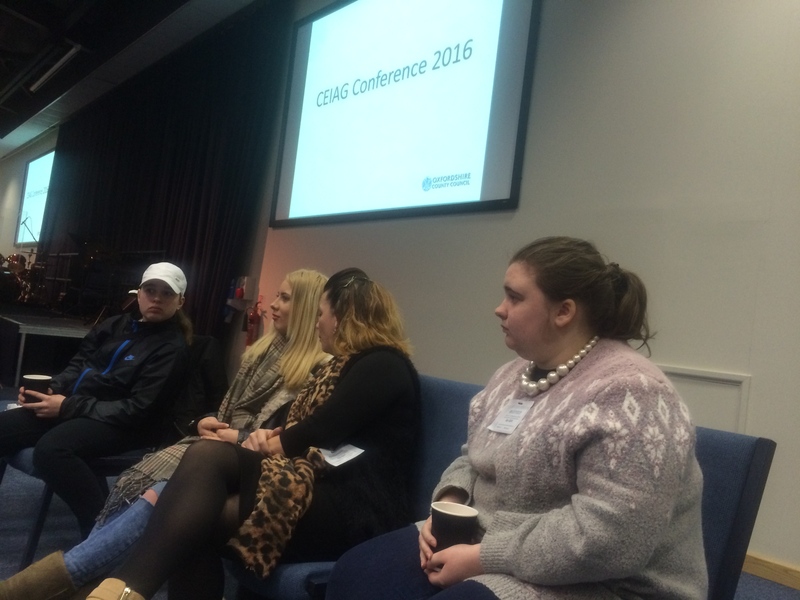 Some of the Go_Girls bravely shared the challenges that they had faced with their autism. Bullying, lack of school support, struggling with loud noises and unexpected changes, social isolation and feeling misunderstood were issues raised in their speeches. However, when young women with autism are respected, understood and given the support they need they can flourish. We watched a fantastic video all about the only state school for girls with autism in the UK. The girls in this mini documentary had been able to pursue their passions in an accepting and welcoming environment. It meant so much to hear from the Go_Girls that they felt this way in the Go_Girl group. In particular, they said that being listened to is so important and they felt that the team really tried to hear what they were trying to say. Referring to autism as an example of ‘neurodiversity’ moves away from seeing it as an isolated ‘learning difficulty’ towards celebrating it as part of a more inclusive neurological spectrum. Luckily, the world is waking up and becoming better informed about autism. JP Morgan, for example, is specifically seeking to employ autistic people because of the passion, focus and aptitude that they have. A survey by the National Autistic Society found that only 16% of autistic people are in full-time work, despite 77% saying that they would like to be employed. Hopefully this will change in the coming years so that more autistic people can have the opportunity to pursue a fulfilling career. Here at Go_Girl we will be supporting each other, no matter where we are in the spectrum of neurodiversity, to make our future goals happen. The Go_Girls continue to keep up the momentum and push forward with their projects! Some are adding to and fine-tuning their work. Others are nearly done with their original projects and are creating an additional one to complement the original work. Slide presentations are also being developed to accompany projects. Project presentation time is fast approaching and the Go_Girls are a bit nervous. However, they are also excited about showcasing and discussing their work! There will be a variety of projects to exhibit, including a book review app, a game intended to educate and help people with mental illness, and a game designed to teach people to be patient and aware of their surroundings as they manipulate the character to jump over numerous obstacles. These are just a few of the meaningful projects being created. Stayed tuned for more updates on their progress! With the Easter break just over the horizon, the whole team felt extra motivated this week to make good headway with their projects. However, keeping up the momentum on longer term initiatives can sometimes be tricky. Life throws curveballs when you least expect it, and it can be hard to stay motivated in the face of unexpected obstacles. We hope that taking part in Go_Girl builds resilience, which is an essential skill in today’s turbulent world. Working on individual passion projects, as the Go_Girls do, can give a sense of purpose that is very sustaining. The process of creating and succeeding in an individual endeavour can build self-esteem. It also helps to foster problem solving skills when things don’t go to plan! Being part of the Go_Girl team also means being part of a supportive and encouraging social network that is always there to cheer you on! The projects are developing wonderfully, as is all of our resilience! One Go_Girl worked on modelling characters for her game on Unity. Another added a ‘word of the day’ feature to her book review app. Other Go_Girls got their websites up and running. It was a great week full of progress before a well earned Easter week off filled with chocolatey goodness. With almost 2 months to go until the final ceremony, the Go_Girls are hard at work on their individual projects. These range from a game in Unity to websites, to apps, and even games in Scratch. To give the young women some practice with public speaking and presentation of their work, we spent some time on some speaking games! It was exciting to see the young women think about how best to present and talk about their work, and we also challenged them to do some creative story telling on the spot. Making use of a random word generator, each young woman was given two words that they had to weave into a story on the spot – it definitely made for some interesting tales! It’s absolutely fantastic to see how far some of these young women have come in terms of public speaking – some who weren’t even willing to introduce themselves at the start of the year nearly had us in splits of laughter with their witty storytelling. The bulk of the sessions were devoted to work on on their projects, which are all coming along at a great pace. The range of creativity and coding techniques is allowing the young women to showcase their interests and designs. While some are tackling more complex code, those that are nearing the completion of their initial ideas are now working on adding more complexity in order to really push their limits. We are really excited by all the progress and look forward to seeing what else the young women can achieve! Many of the Go_Girl group had heard of apprenticeships, but were surprised to see the variety of opportunities available. We also talked about traineeships, which some of the group had not heard of. Traineeships provide high quality work experience alongside support in gaining English and Maths skills. They often progress onto apprenticeships, and can be a great way to get a ‘foot in the door’. Together, we explored the Workfinder web app from Founders4Schools, which offers young people the opportunity to search for jobs, traineeships and apprenticeships near where they live. Next, we all had a go at signing up to the Government’s apprenticeship finding website, which helps you to look for opportunities in your area. There was a lot on offer in the Oxfordshire area, from hospitality and hairdressing to animal rescue. The government wants to see 3 million young people training as apprentices by 2020 – perhaps some of the Go_Girl team will be part of this movement! After a break and some cake to celebrate two birthdays in the group, we carried on working on our projects. The Go_Girls are putting in so much hard work to make their projects a reality, even working on them in their spare time where possible. 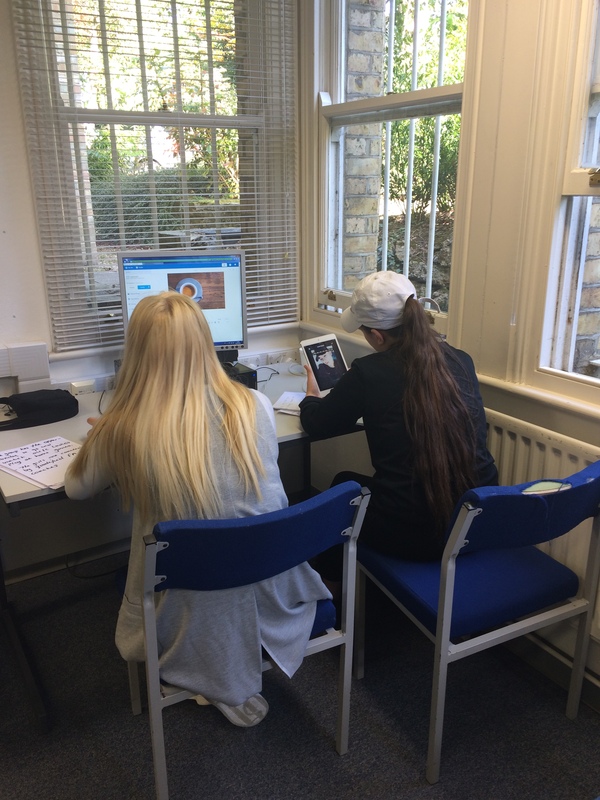 Not everyone has Internet access at home, so some of the young women have been coming into the Education department on extra days to put in the hours on their initiatives. One of the Go_Girls is busy modelling her game character on Unity at the moment – impressive stuff! The ‘Beast from the East’ was in full force this week, smothering Oxford in a blanket of fresh snowy powder blown in by icy winds. Sadly the Wednesday session had to be cancelled due to road safety concerns, but the Tuesday group managed to meet before the big freeze! We started the workshop this week with another fantastic TedTalk, this time by Reshma Saujani – founder of Girls Who Code. In this talk Saujani explores the way that society’s normative expectations of femininity shape girls to seek perfection, rather than to be brave. She believes that learning to code offers girls a chance to be brave and reshape their understanding of their own abilities and what girls can do as a whole. We all agreed with her point that coding can be frustrating at times – it often takes many tries until the code will finally work. However, this iterative process of tweaking and tinkering with whichever language you are programming in is an essential part of the coding process – you need to become comfortable with ‘failure’ as in fact this is how you learn and eventually succeed. Today the Go_Girl group also got to try out high fidelity prototyping using Axure RP. One of the Go_Girls is creating a mobile app for her book reviews. It was fantastic to see her ideas come to life on the screen. We are all looking forward to trying out the app ourselves in the coming weeks. 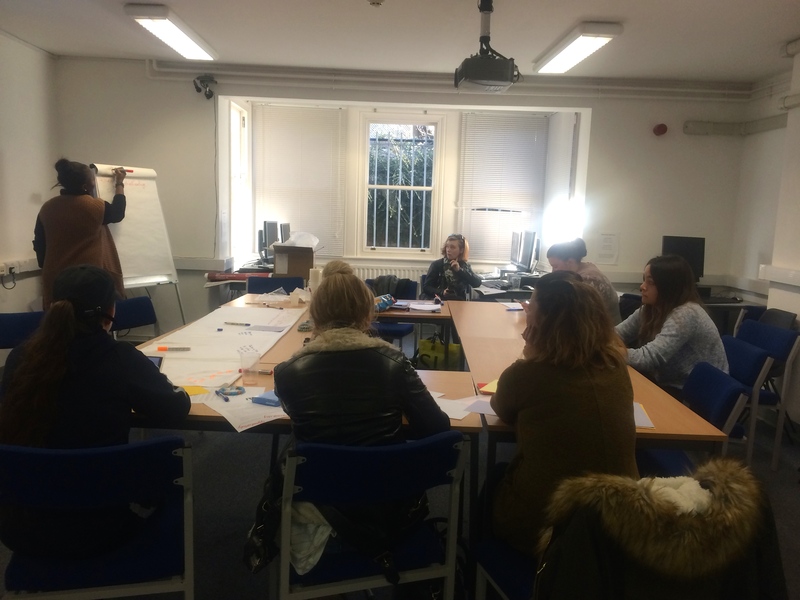 Session 26: What does feminism mean to us? Go_Girl is, as the name suggests, a project specifically for female-identifying young people. By its very nature, then, Go_Girl is built on the feminist notion that there is value in a women-only, peer supportive space. The program also recognises that gender, whilst always intersecting with class, race and (dis)ability, shapes young people’s technological and educational opportunities. Young women continue to be underrepresented in STEM fields and careers. Go_Girl hopes to explore the challenges girls face, and benefits they gain, in interacting with technology. Whilst Go_Girl is therefore feminist to its core, there is a tendency for this to be forgotten when we are all busy learning how to use prototyping platforms and design games on Unity. The session today, therefore, aimed to bring the concept of feminism to the fore. We kicked things off with the iconic TedTalk given by the inimitable Chimamanda Ngozi Adichie, entitled ‘We should all be feminists‘. Watching the video sparked some really interesting conversations about how gender norms have affected each of our lives. Everyone had very different experiences to share. The Go_Girls have had to overcome numerous challenges and adversities in their lives to get where they are today. They have moved from seeing themselves as victims to identifying as survivors, and are becoming agents for social change. Bringing about this transition in the young women’s lives is at the heart of Go_Girl. For some of the Go_Girls, the word ‘feminist’ has negative connotations – they argued that it seems outdated in this day and age, a bit aggressive even. This also lead to a really engaging debate about why the word feminist is still important to some of the other young women, and how the battle for equality is far from over. The word feminist highlights the lack of power women currently hold in comparison to men. We can use the word ‘equalitist’ when true equity has been achieved. But with the pay gap far from being closed, amongst many other issues, that still seems a long way off! It’s great to be able to share our thoughts and feelings in the supportive environment that Go_Girl provides. With everyone fired up after these discussions we then moved on to working on our individual projects. 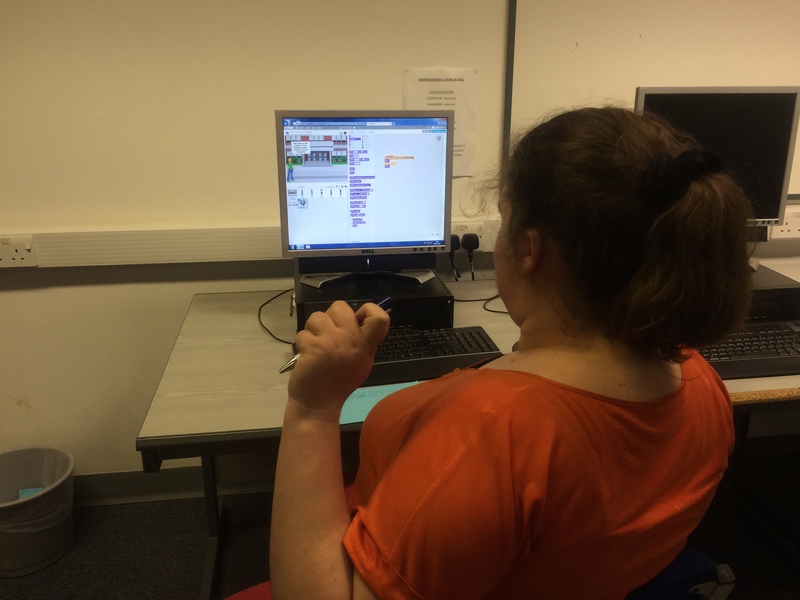 There was lots of game design going on – it’s great to see how creative programming can be! We all can’t wait to give the games a go once they are finished! 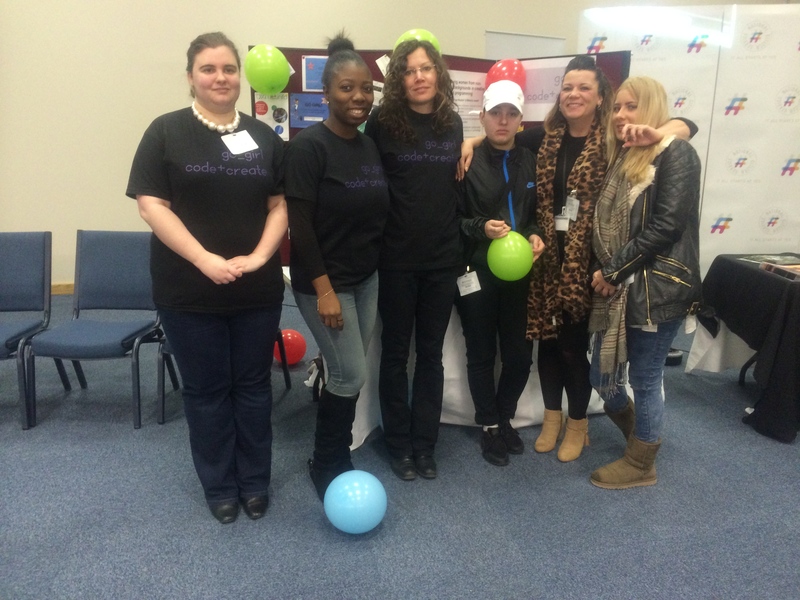 On February 6th the Go_Girl team headed off to the ninth annual ‘Careers Fest’ at the Oxford MINI Plant. Over all, we had a great experience. There were lots of interesting companies to talk to. UK Atomic Energy Agency, Microsoft, Sophos, Nielsen and Thames Valley Police were just some of the organisations in attendance. The MINI displays were pretty cool too! Whilst it was an interesting experience attending the fair, some of the employers proved difficult to speak to. Many just kept saying ‘look online’ when asked about current openings. We were a bit disappointed as we had hoped to give out some CVs and hear about specific job opportunities. The Armed Forces team were the most informative about current application procedures, including the fact that girls can now apply to the Royal Marines! Back at the University, we kept working away on our projects. Each Go_Girl needs a different range of technical skills to complete their own concept. We have been working hard on building up our HTML, Scratch and Unity abilities. Stay tuned for more updates on these exciting ventures! Session 20: Real life role models and coding superpowers! Jo Hannaford, Partner and Head of the EMEA Technology Division and global head of Quality Assurance Engineering at Goldman Sachs, along with her husband Jon, paid a visit to the Go_Girls and shared stories about her journey from being a student who regularly skipped school to becoming one of the most accomplished female programmers in Europe. She shared how the sudden death of her father, which left her mother without a source of income, prompted her to become serious about education and pursuing a career. She faced resistance and encountered those who doubted her ability to become a software engineer, a profession dominated by men. However, she did not allow the negative messages of others to stop her from reaching her goal. Some of the Go_Girls shared their experiences of interviewing for jobs and not getting a call back and Jo responded by talking about the importance of being persistent and utilizing one’s network to find employment. She also encouraged the girls to have a variety of work experiences and to choose an occupation that they really love. Jo’s talk was a source of inspiration for the young women as well as the Go_Girl staff members! Jo’s talk was very impactful! She is a real life role model for the young women and we look forward to her next visit! During the second half of the session, the young women celebrated Computer Science Education Week by participating in the Hour of Code. They completed a fun Scratch-based exercise related to the Wonder Woman movie and each of the young women received an Hour of Code certificate of completion. It was a fantastic session! 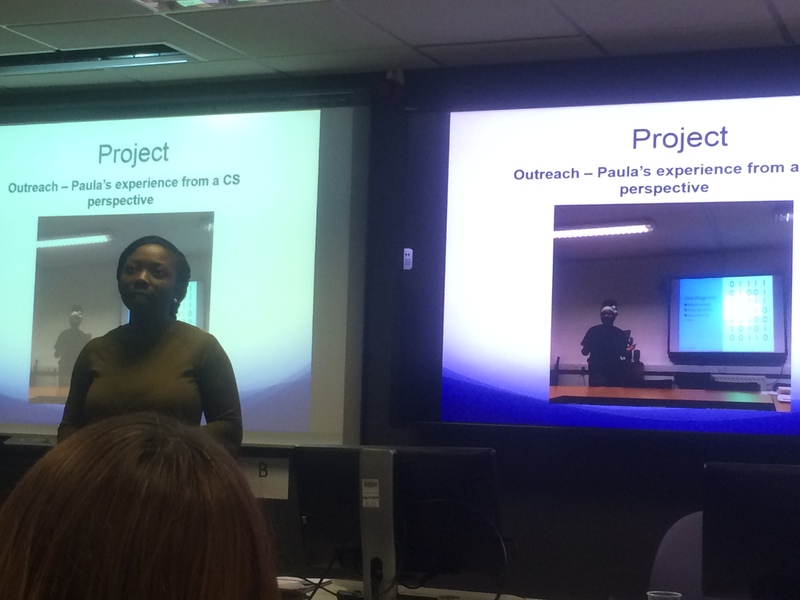 Inspired by Julian Box talking about tech careers last week, this Go_Girl session tackled the issue of CVs. The average time a recruiter will spend looking at a CV is 5-7 seconds, and 76% of CVs are ignored if the email address given is ‘unprofessional’. It was really interesting talking to the young women and hearing about their experiences of applying for jobs. Many of them have had disheartening encounters with bullying bosses and ableist colleagues. In the hope of giving the Go_Girls the best chance possible of winning their dream careers we spent part of the session writing and formatting their CVs. We then moved on to exploring Turtlestitch, an amazing piece of technology that enables users to code patterns which are then printed by embroidery machines. This is right up the Go_Girls’ street – they are a very creative bunch! After a demonstration from one of last year’s participants the young women began creating their codes. It will be really exciting to see the finished embroidery in the coming weeks! After a well-earned half term break the Go_Girls were back in the classroom and raring to get going. As with every session, we began with a group feedback exercise where the young women get to share what they’ve been up to over the past week. The one thing that always stands out to me is how very unique each of these young women are. They may all have been labelled ‘NEET’ (not in education, employment or training) by the government, and therefore eligible for the Go_Girl programme. But every single member of this group has a very different story to tell as to how they ended up in this situation. They all have their own individual challenges to face, but also their own strengths to draw upon. Every single Go_Girl has interests that distinguish them from their peers. The Go_Girl programme aims to help nurture this individuality by enabling the young women to create their own projects. 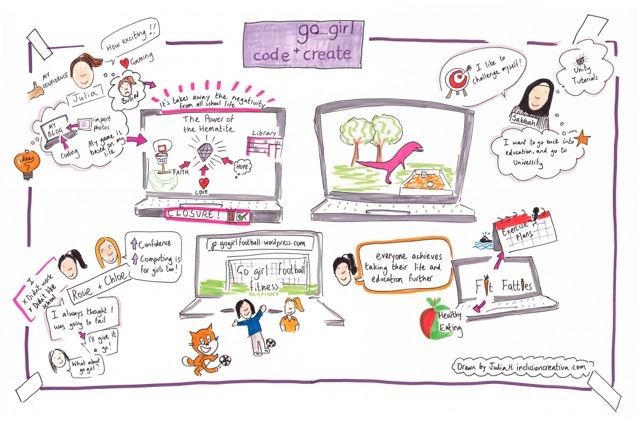 These endeavours combine coding and the Go_Girls’ other passions in creative and exciting ways. 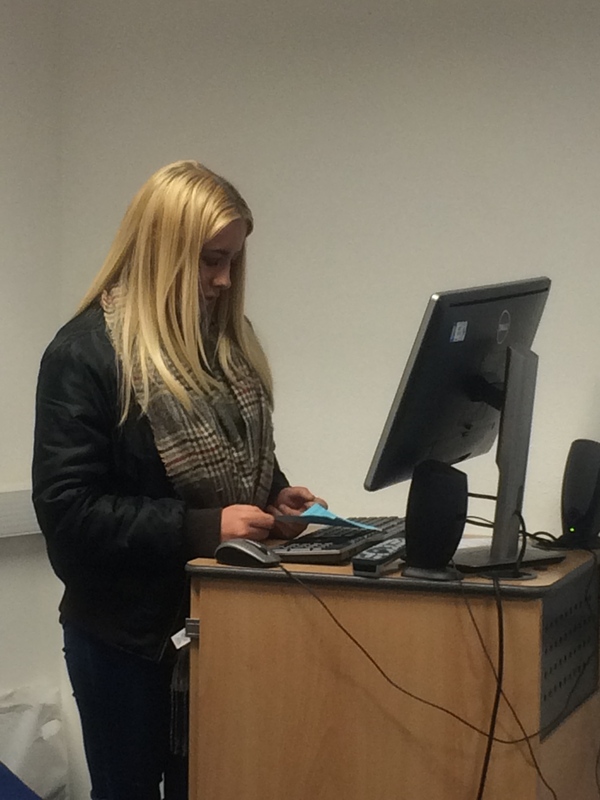 For example, one of the young women hopes to create a blog profiling stories of homeless people in Oxford, as well as information on how the public can help address this issue. This idea was inspired by her own experiences of homelessness. One of the other young women is hoping to create computer-generated textiles using a code-operated sewing machine. This week the young women got lots of time to work on their projects as well as support from the team with the code and computer skills that they might need. We are looking forward to seeing how these exciting ideas progress! No matter how speaking to a group of strangers might make us feel, however, it cannot be avoided. Being able to present effectively is a vital life skill. Certainly, we won’t all be giving speeches in the House of Commons. But all of us at some point will have to speak in a meeting, attend an interview or even argue our case to a complaints department. 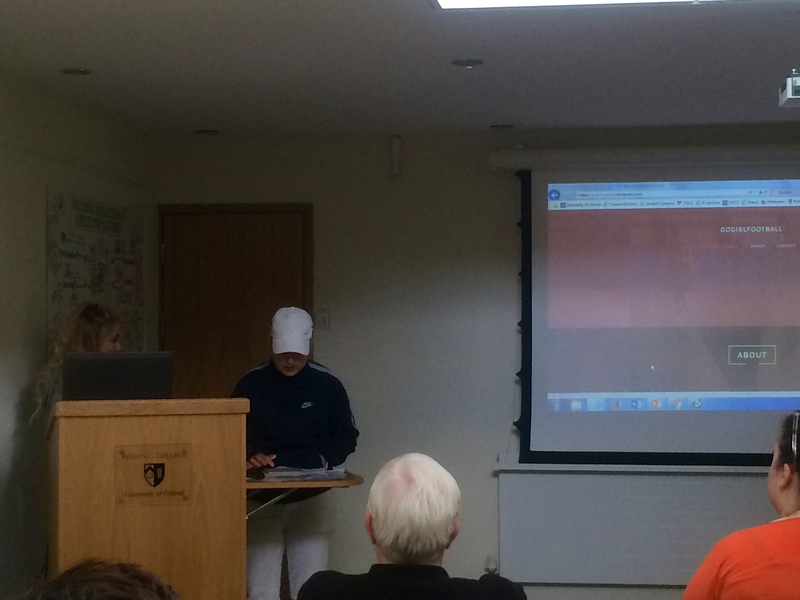 Today the Go_Girls faced their fears and gave giving a presentation a go. The session started with watching Nancy Duarte’s TedTalk on the ‘Structure of Great Talks’, and discussing why presentation skills might be important in the Go_Girls’ lives. We then played a fantastic game called ‘Toastmaster’. A cup with words like Digital, HTML and ‘Go_Girl’ was passed around the room. Everyone had to pick out a word and then give a short impromptu speech on that topic. 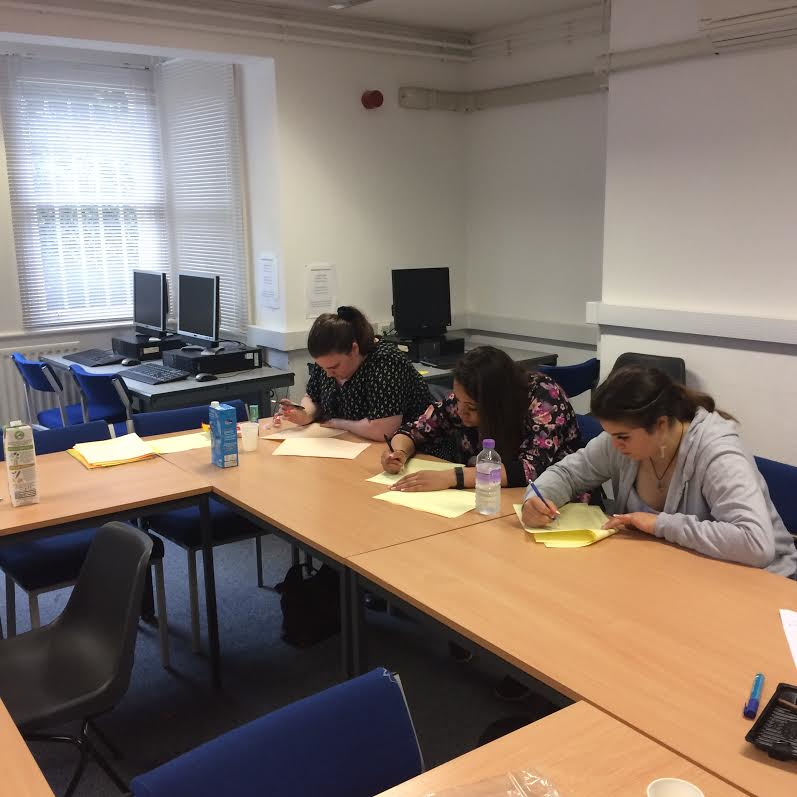 This exercise provided a really fun and light-hearted way to get a bit of presentation practice, and even the shyer members of the group felt able to join in. 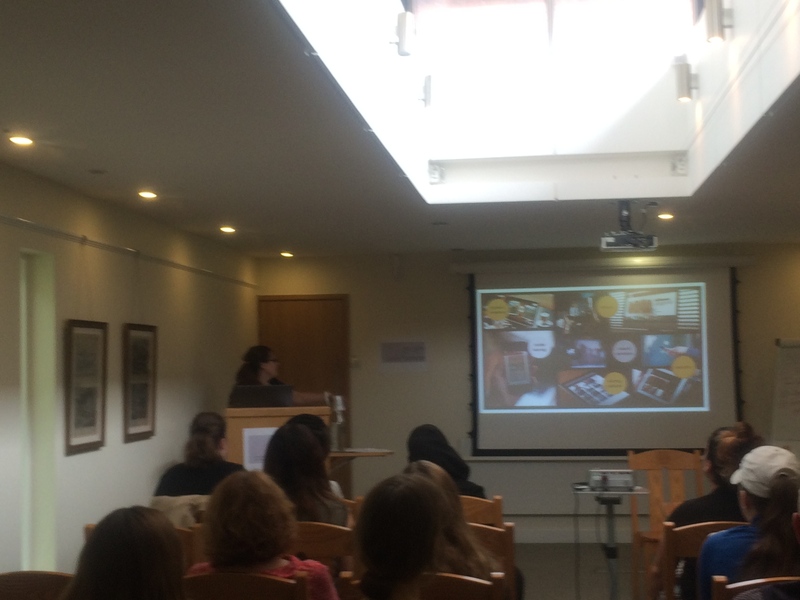 The session finished with the young women creating their own presentations using either Office PowerPoint or Prezi. It was great to see the Go_Girls putting what they had learnt into practice. We have a number of opportunities to present coming up, and we can’t wait to see these brilliant young women give it their all! 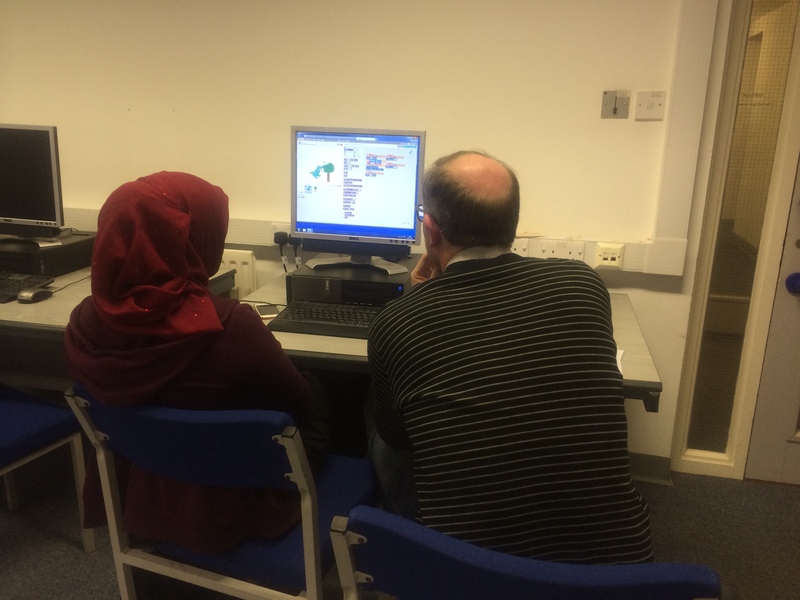 Session 13: Coding – a guessing game? This week the Go_Girls got straight back into Scratch with a fun and challenging task. The young women were asked to create a ‘guessing game’ using the skills they had learnt last week. The little ‘sprite’, or animated character, central to the Scratch interface can be programmed to randomly choose a number between 1 and 100. It can also be programmed to ask the gamer to guess ‘higher’ or ‘lower’ depending on what number they type in, until the correct number is guessed. This activity provided a great opportunity to discuss some of the key programming concepts, such as loops. Scratch is proving to be a brilliant tool for bringing to life some of these abstract ideas in a tangible and enjoyable way. Once the games had been completed we moved on to talking about presentation skills. We all downloaded Office and started to explore PowerPoint and Word. The Go_Girls will be asked to present their final projects at the end of the programme to an audience – not an easy feat, especially for the shier members of the group. Being able to present your ideas clearly and effectively, however, is a key skill for anyone entering further education or the workplace. 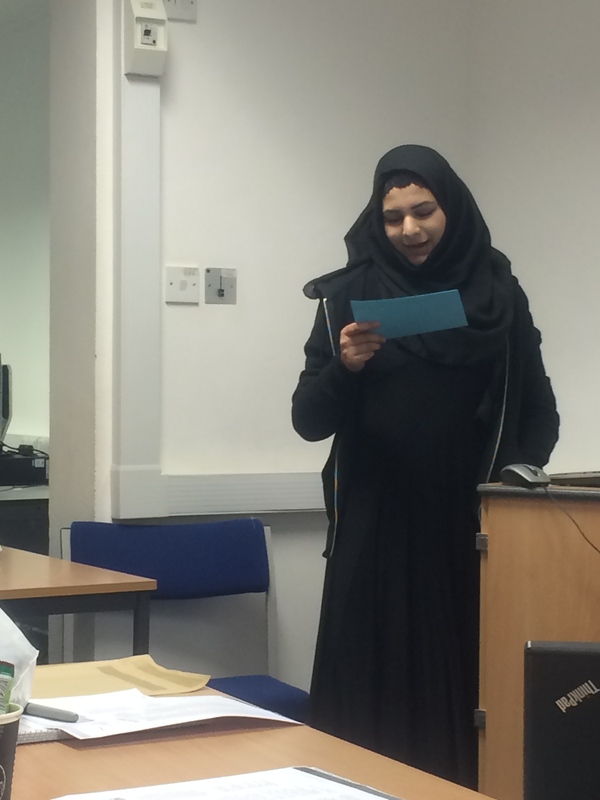 We are really looking forward to seeing how the young women’s public speaking abilities develop in the coming weeks. Are you an angry birds devotee? Or perhaps you’re more of a FIFA fan? If neither of those options appeal, then surely you’ve enjoyed a round of Pac-Man or Tetris in your time? Online gaming is a global phenomenon – the UKIE estimates that there are between 2.2 and 2.6 billion gamers worldwide, and that the gaming market will be worth $128.5 billion by the end of 2020! How many of these gaming fans, however, have had a go at coding a game themselves? 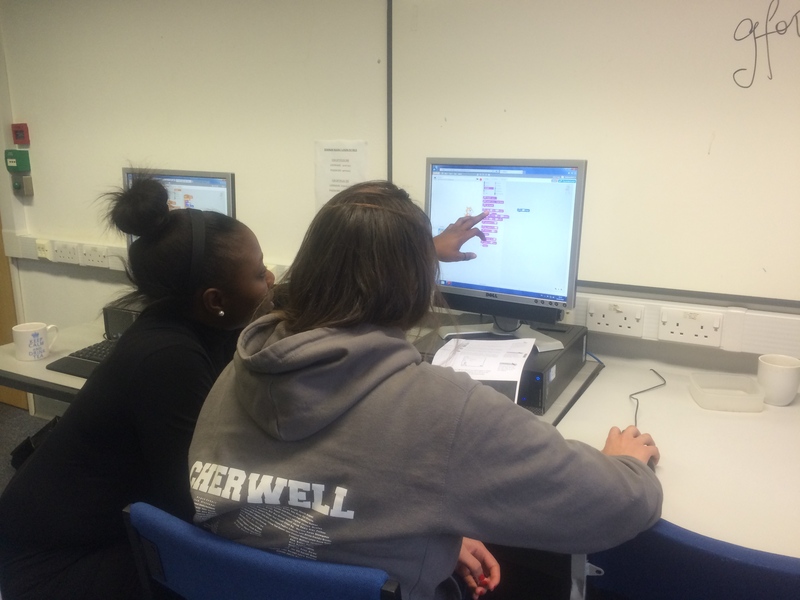 This week the Go_Girls got to do exactly that using an online platform called Scratch. Scratch enables users to build ‘scripts’ by dragging and dropping various ‘command’ blocks to create interactive games and animations. One of last year’s Go_Girl team came in to present the game that she created last year. This really inspired the other Go_Girls, and soon they were getting started on all sorts of fun creations. We will be working on Scratch next week too, so stay tuned for more updates on this! The Internet is everywhere – but do we know how to define it? This week the Go_Girls explored the difference between the Internet and the World Wide Web, as well as coding their own webpage. Impressive going for a grey September afternoon! To begin the session we watched a few excellent TedTalks to spark an informative discussion. We learnt that the Internet is the actual infrastructure which links the world’s computers together, enabling them to communicate. Meanwhile, the ‘Web’ lives on the Internet. It is one of the many ways of accessing information on the Internet by utilising browsers that link webpages together. Tim Berners-Lee, the father of the Web, is based in Oxford Computer Science Department (no biggie). Some of the Go_Girls were keen to meet him and thank him for what he created. Fingers crossed for a Berners Lee/Go_Girl collaboration some time in the future! Time to follow in Tim’s footsteps and do some coding of our own! Some of the Go_Girls felt a little daunted at the prospect, but by the end of the session everyone had coded their own webpage! It was really amazing to see the look on the young women’s faces when all their hard work paid off. The key was in the tags. Once you knew what these various commands meant and where to deploy them – hey presto! – you had a webpage. We finished the session by planning out the Go_Girls’ individual projects, which they will be working on over the coming weeks. Some hope to create their own games, whilst others want to start websites exploring everything from mental health to the stereotypes affecting young women in mechanics. Supporting the young women to achieve their goals is an absolute privilege – we can’t wait to see how much they will achieve! 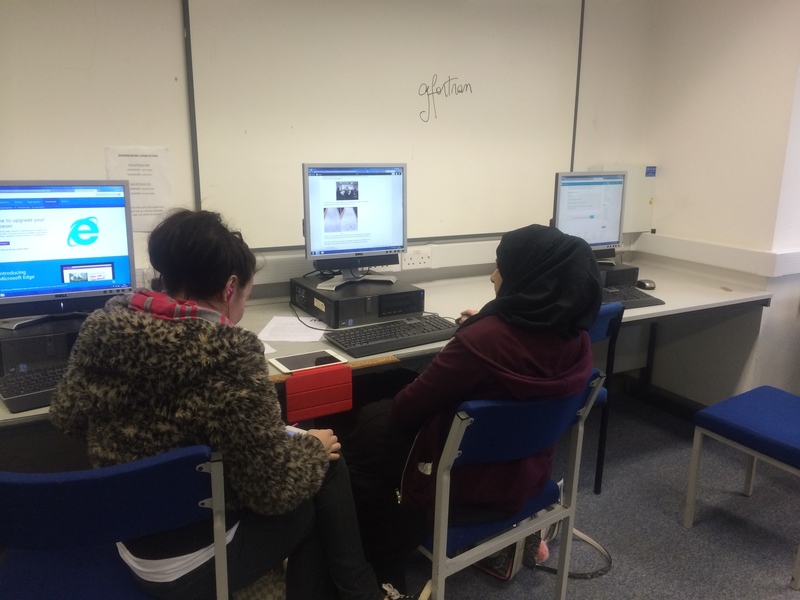 Following on from the great success of last week’s blogging session, this week saw the Go_Girls continue to work on their individual sites. 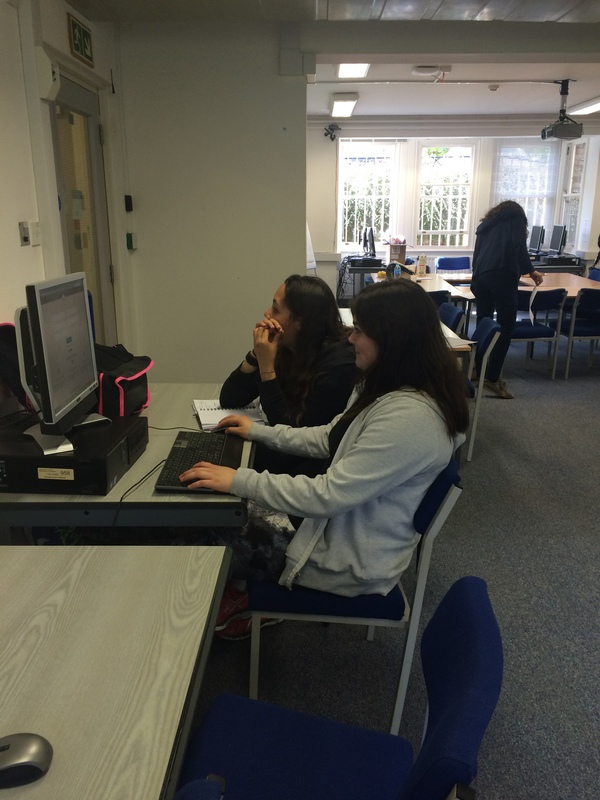 Some of the young women have been working on their blogs in their own free time, adding new posts and information. They are all very different, reflecting the diversity of interests that the Go_Girls hold. The young women were taught how to ‘inspect’ the code that lies behind their customised pages. Seeing how particular commands could be altered to make a blog title bold or underlined, for example, enabled the Go_Girls to begin learning code in a more tangible way. With all this hard work going on, a bit of light relief was required. Luckily, an activity had been planned that involved the Go_Girls writing out ‘codes’ for a ‘robot’ (i.e. one of the research team) to carry out. The ‘codes’ were linked to different movements – an arrow pointing upwards means jump upwards, for example. The young women could also get creative and make their own codes, if they wished. 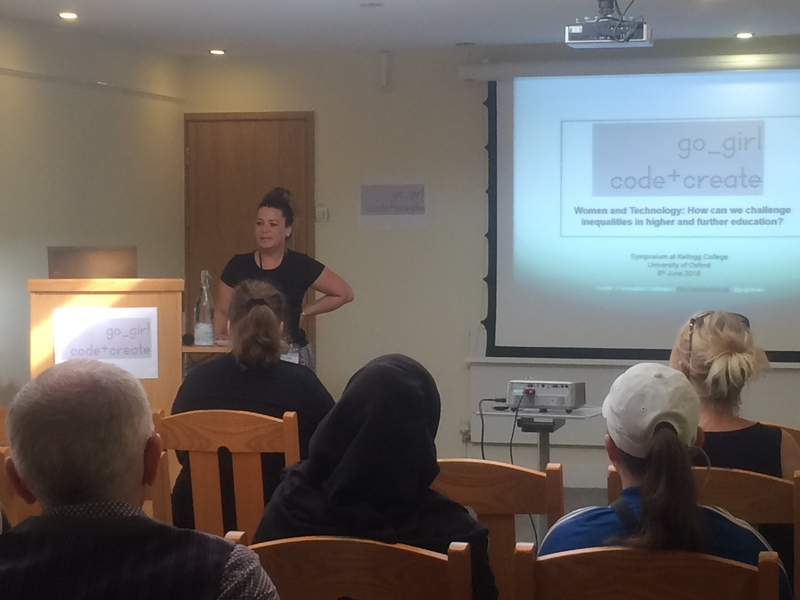 There was a lot of laughter during this exercise – in particular when one of the robot researchers attempted the Irish jig – and it was also a brilliant way for the Go_Girls to get to grips with writing ‘code’. Session 9: The Go_Girls Enter the Blogosphere! The Go_Girls enjoyed a fun-filled summer with trips to Bourmouth Beach and Cadbury World. The summer fun has come to an end. However, our exciting fall sessions are now in full swing! 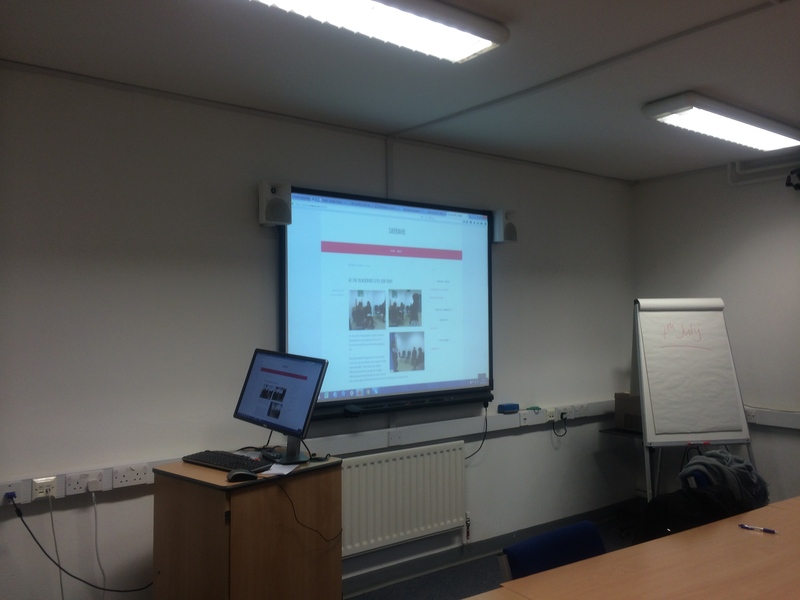 We kicked off our first meeting with an introduction to WordPress, a web publishing tool. The focus this week was on creating a blog and learning about the similarities and differences between blogs and websites. The young women were tasked with developing names for their blogs and thinking about topics. Several examples of blogs were reviewed including our very own Go_Girl blog, as well as blogs about poetry, celebrity animals, food, fashion, and more. There was lots of serious brainstorming going on in this session and the young women were very imaginative and created some catchy blog names! There was interest in a variety of blogpost topics including World War II, carpentry, video game reviews, tattoo art, and music videos. In addition to creating blogs using WordPress, the young women learned about domain extensions and what they represent and the talented designer of our Go_Girl mascot gave us a lesson on colour theory as it relates to art and web design. That was a real treat! Work on the blogs will continue and we will have a look at the code behind the sites in upcoming sessions. Be sure to watch this space for more updates! The smell of melted chocolate, big smiles and the bags of goodies sums up our go girl summer tours. We started off early, with sleepy eyes and coffee, to Cadbury’s world in Birmingham. We arrived at Bournville in time for the factory tour. The tour started with a brief presentation by the Cadbury representative. She gave us background information about how the company started, its growth rate and current status as well as opportunities for apprenticeship or internships. Then we proceeded to the changing room to get prepared for a tour of the different sections of the chocolate factory. We learnt about the different phases of chocolate making, the use of customized moulds to form the chocolate shapes and the super fast machines that handled the packaging process. Finally, we had an informal discussion with 10 female employees of the company. It was was a great time to learn about their roles and responsibilities as well as the challenges they face as women within the different teams in the company. The tour ended with some goodie bags containing loads of chocolate and words of encouragement from the employees. We had a great time! It’s summertime at go_girl! To celebrate the holidays and make the most of the amazing sunshine, we spent a fantastic day away at the beach in Bournemouth today. The weather was perfect, as was the delicious Fish & Chips at the seaside. Some very brave go_girls even went for a swim in the (cold) sea! 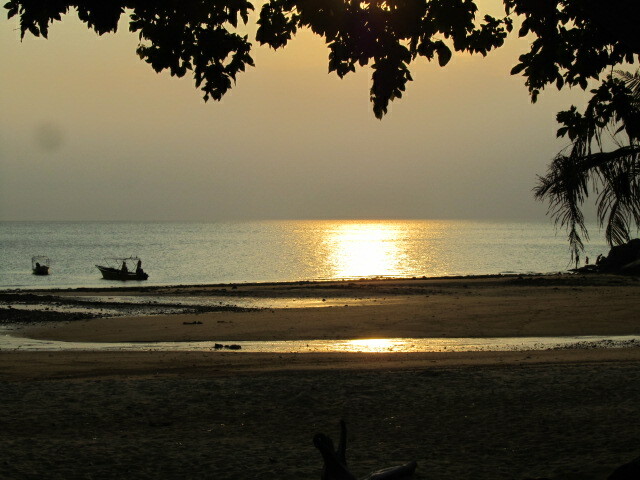 …and the beach with palmtrees. …and sampling amazing Fish & Chips! And then, off to the beach! JJ and Tia braving the cold water! 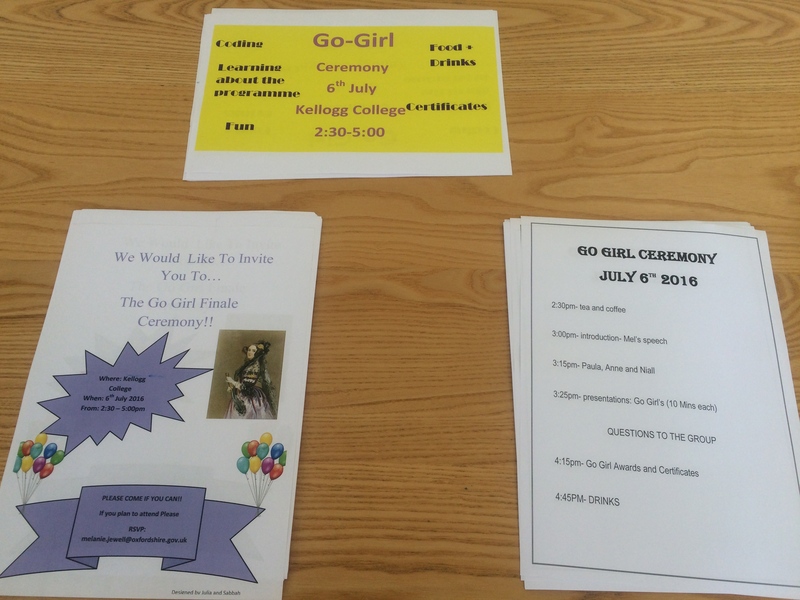 It is hard to believe that we are at the end of the Go_Girl summer term! The last eight weeks have far exceeded everyone’s expectations in terms of the young women’s progress. They are very much on the way to ascertaining their goals and achieving them, and should feel really proud of all of the hurdles that they have overcome in recent months. For the summer finale we began by watching a selection of fascinating TedTalks, which explored some of the topics we’ve been covering so far. In particular, Jennifer Doudna’s TedTalk on human DNA alteration was a brilliant watch. It showed us all how coding is not just relegated to computers, but that also our own bodies are made up of complex patterns. Cracking the code of the genome has hugely beneficial potential in terms of treating genetic disease, but Jennifer was also keen to open up some of the ethical dilemmas that ‘editing’ our genetic make-up could hold. The Go_Girls all said that they found the discussion interesting – a great intro to the sequence-based programming we’ll be doing next term. With their new laptops in hand, they will be able to look up all kinds of information over the summer break too – perhaps even a few more Ted videos! 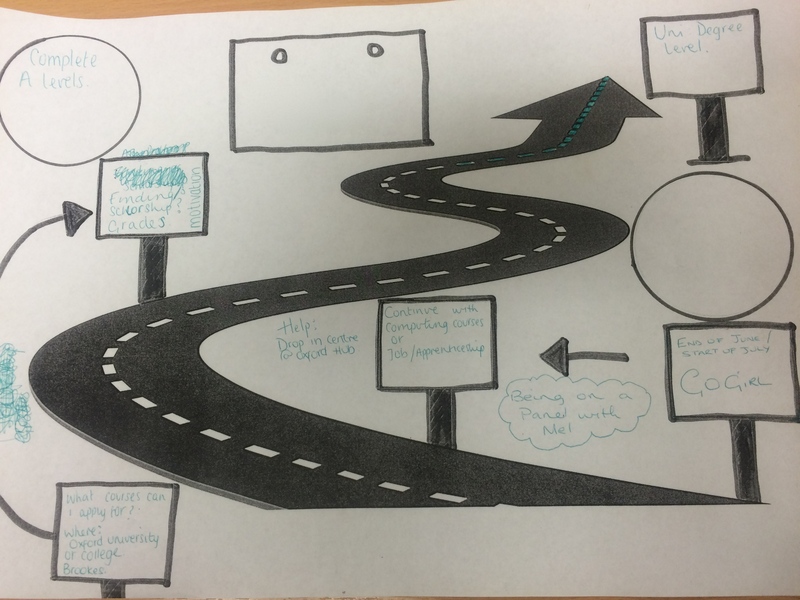 To end the session the young women created vision boards to help them on their way to achieving their aspirations. Visualising success has been proven to play a major role in the actual attainment of success. Sports psychologists, for example, have proven that athletes who imagine winning races then actually go on to get the fastest times. With this in mind, the Go_Girls set about mapping their dreams for the future. Some of the young women hope for a family, others to travel the world. Many of the Go_Girls explored their ideal careers, and the steps they hope to take to make them a reality. It was such a fun and creative way to welcome the summer holidays. With their new laptops in hand, the young women are excited to begin exploring job and further study possibilities. We can’t wait to catch up with them again in August on our group trip to the seaside. This week the Go_Girls tackled one of the most talked about pressures of our time – body image. Anyone with Instagram knows that tanned, toned (and more often than not edited) selfies are de rigueur on this social app. It’s hardly surprising that trying to keep up with these unrealistic #bodygoals can lead young people to struggle with their mental health. 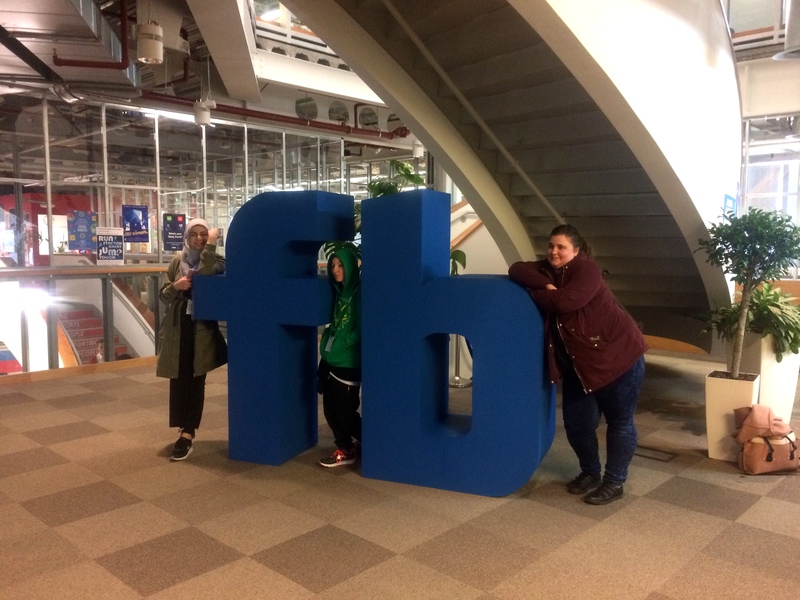 As a group we shared some of the worries and concerns that we have about social media pressures and body ideals, as well as some tips for improving self-confidence. Surrounding yourself with positive people, who boost you rather than knocking you down, is key. After all, the ‘thigh gap’ and ‘thick thigh’ trends will come and go, but true friendship lasts a lifetime. An important part of being self-confident and forging positive relationships is knowing what your values and aspirations are. For the second part of the session the young women defined the values and aspirations that they hold. For some this included family, friends, happiness and health, whilst for others independence, helping the community and being determined came first. This exercise was a really positive step for the young women towards finding, and reaching, their future goals. Goals that have nothing to do with an ideal dress size, but instead family, friend and career ambitions. The Go_Girls shared some of these in a second round of selfie videos. The sessions this week were so full of optimism and hope for the future that they ended with us all dancing for joy …. literally! Everyone got on their feet to pull some moves to the cheesy disco classic ‘the Cha Cha slide’. A very happy way to end the week – roll on session 7! We had an excellent week this week, where we continued our dicussions with the young women about being safe online. We kicked off both our sessions with a conversation about finance, debt and benefits that the young women had with a representative from the Department of Work and Pensions. It gave the young women a chance to talk about the jobs they’ve had, what they’ve learned, and what options they needed to consider in their current job-hunts. We talked full-time jobs, apprenticeships and everything in between! 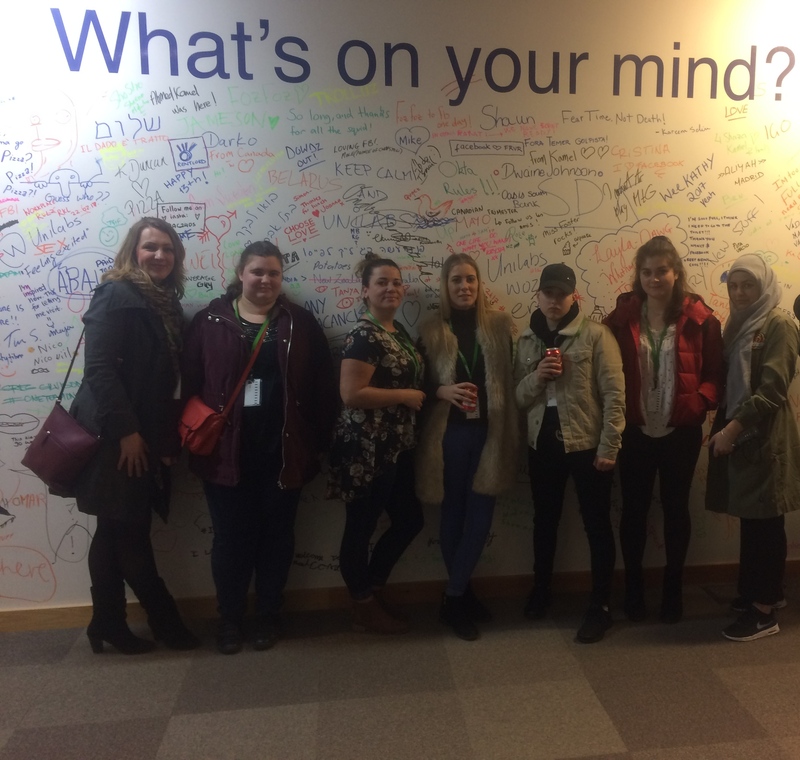 When talking about digital safety, we enjoyed an excellent discussion with the young women about how they approached posting information online – what were the safeguards that they put in place for themselves when using social media? This led to interesting discussions around self-image and how we represent ourselves online. We put this into practice by going outside and starting with video introductions (‘video selfies’). Some of the young women did not yet feel comfortable to be in front of the camera, but found creative ways to introduce themselves nonetheless. We were all very impressed! We encouraged the young women to reflect in their short videos on what they wanted to achieve through go_girl, why they were in fact here at go_girl, and then, coinciding with International Selfie Day, spent some time in the sun making these fun ‘selfie videos’ to capture those thoughts, and showcase some creativity! Next week we will revisit some of the issues around self-image and body image and how different people represent themselves online, and will move towards writing our own blog posts. 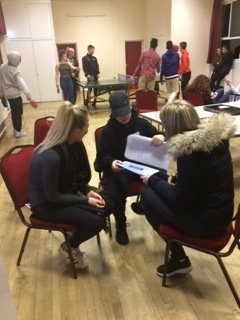 Today was a very busy day for the go_girls: in the morning, the young women attended the Open Day at Rose Hill Youth Services together with Mel, where they introduced go_girl to other young people, youth- and social workers, and took part in a number of activities. The young women created a go_girl stand and answered queries of visitors. In the afternoon, we all came to the Oxford Martin School at the University of Oxford for this year’s OxTALENT award ceremony. It was a brilliant event! We won in the category ‘Outreach & Widening Participation’. We are over the moon and so proud. Huge thanks to the organising committee of the OxTALENT competition, and to Goldman Sachs Gives for their support. Congrats go_girls!!! Niall accepting the OxTALENT award on behalf of all! Next week, it will be back to the weekly sessions with Pseudocoding and video production and -editing. Looking forward to it! This week we focused on relationships. After our routine check-in we jumped right in by discussing what makes up both healthy and unhealthy relationships. For healthy relationships we found that trust, support, compassion and being able to banter without taking it too far are most important. As far as indicators of unhealthy relationships go the major red flags were abuse and being taken advantage of. It was a passionate discussion and definitely brought the group closer. After discussing what makes relationships healthy and unhealthy we went through hypothetical situations and how we would handle those. One of the questions that generated a lot of dialogue and amazing responses was “what would you do if your friends gave you a hard time for taking school and homework seriously?” Ebonee responded with “talk to me when you’re cycling and taking the bus and I’m riding around in my whip!” Another said, “Don’t mess with my future!” The overall activity was productive and a nice way to share our experiences with each other. The two activities generated a lot of discussion so time went by faster than expected. In our first group of the week, we then moved on to relationships and friendships online and to a discussion about being safe online, particularly on social media. This will also be important for later on, when we start writing our own blogs. We will revisit the topic then. In the second group, we didn’t get a chance to talk about being safe online and go over the pseudocoding this week but we will in our next session. We decided to use the last bit of time in the session to hand out the phones and laptops. Everyone was so excited to receive their new laptops. Ebonee said it felt like Christmas and they said they couldn’t wait to get to work on their go girl projects. We can’t wait either! Next week the go girls are headed to Rose Hill to represent the program! We’re looking forward to updating you all on that next week. Session 3: What’s coding got to do with it? 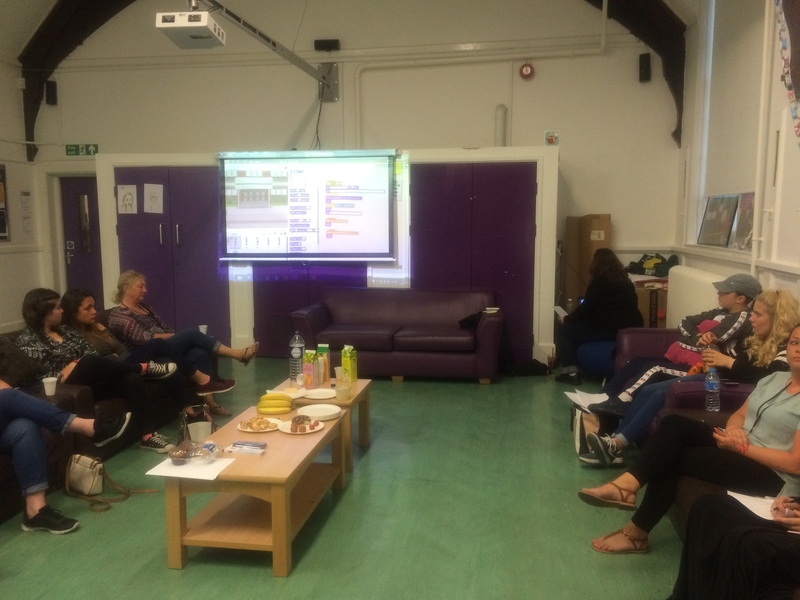 This week’s session was action packed, and intense, and all the go_girls and staff worked hard to challenge some of the notions of what coding is and how to think about it, and to push the boundaries of their comfort. The session started off on a somber note, with a discussion about the events that had unfolded in Manchester . The staff were keen to hear the young womens’ thoughts and help them work through any anxieties they may have, and develop more positive thinking with them. After a very deep, reflective and interesting conversation, the focus turned to the activities of the day, starting with learning how to give a speech! Using an activity from ToastMaster’s , Anne provided the go_girls with prompts on forming a speech on a randomly chosen topic. The young women, despite an initial hesitation, all rose to the challenge, overcoming anxieties that would have held them back in other spaces! It was so exciting to see the go_girls step up to the challenge and perform so well. As you can see from the pictures, the young women embraced the challenge magnificently, and then proceeded to write “programs” for other routine activities – Ebonnee, for example, wrote a piece of code to describe how to brush one’s teeth. Charlotte chipped in with her program on how to arrive at go_girl sessions. The go_girls from both sessions came together to go out for dinner together. Dinner was at Al-Shami, a Lebanese restaurant in Jericho, Oxford. 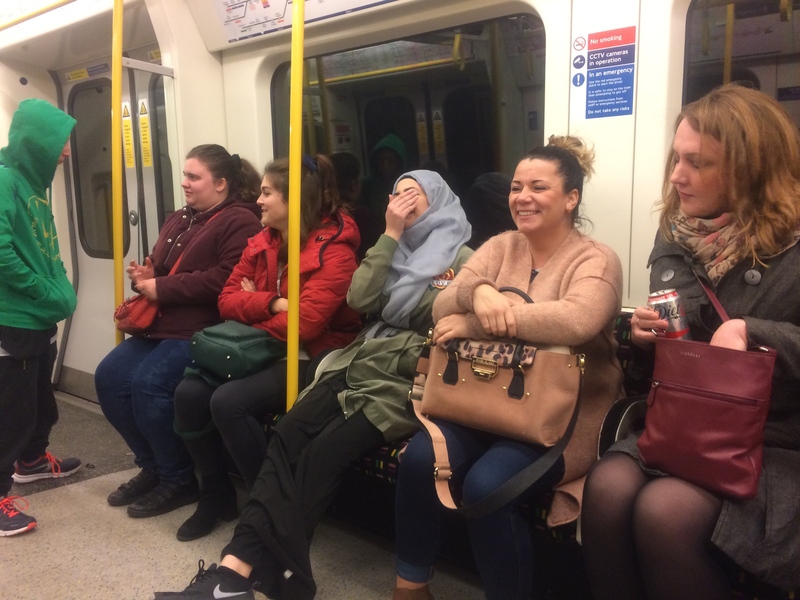 It was a great opportunity for all the young women to come together and try something new in a more informal setting, and a great time for both staff and the go-girls to get to know one another a bit more outside of the weekly sessions, and just be a little silly! Today’s session started with a weekly check-in, a time for each Go_Girl to share and discuss their weekly activities with the group. After the check-in, we had an enlightening lesson on finances. Some of the topics discussed were credit, interest rates, and good and bad debt. We discussed the importance of being a responsible borrower, the problems that can ensue if credit payments are late or go unpaid, and the pitfalls of payday loans. Mel provided contact information for the Oxford Citizens Advice Bureau as well as a list of very useful online resources for additional help and information on finances. We will be exploring these issues in more depth in a future session. 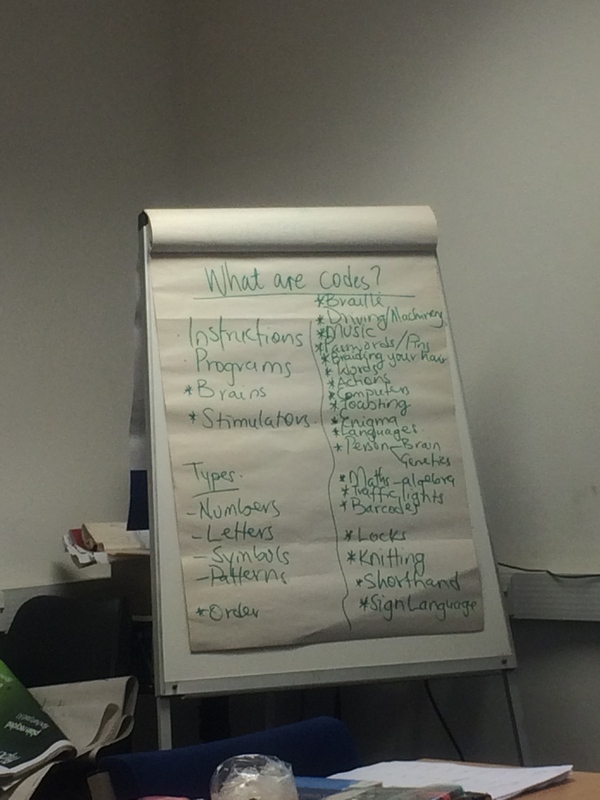 The question “What are codes?” was posed to the girls to help them think about codes in everyday life. In response to this question, they provided several excellent examples of codes, such as braille, music, barcodes, Enigma (the movie), algorithms, coordinates, etc. They then participated in an introduction to coding exercise using plastic cups. The girls worked in pairs, with one person acting as the computer and the other as the programmer (the one who writes the instructions or code), so that the computer knows what to do. A symbol key, comprised of arrows in various directions, was used to write code for assembling the cups in a particular pattern. 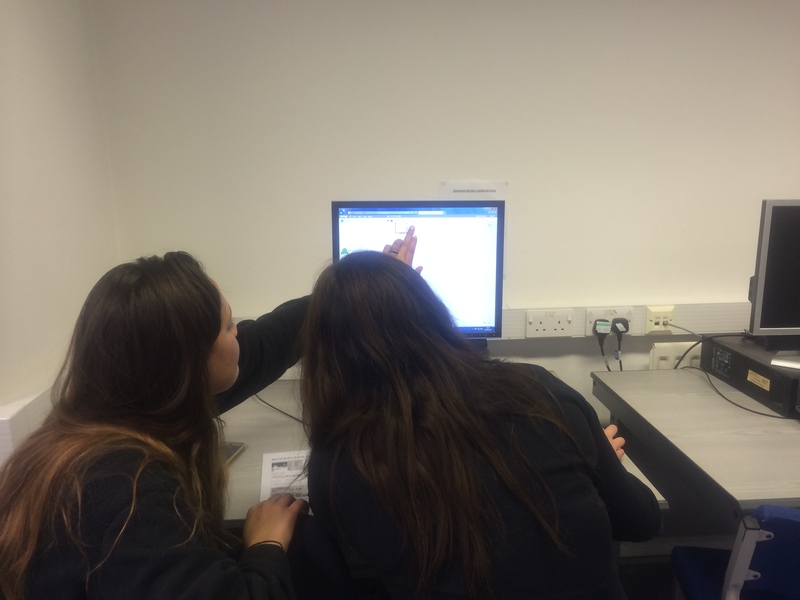 A discussion about debugging code took place as the girls worked to ensure that their codes were accurate. It was a fun day and next week’s activities will build upon what the girls learned in this session. Session 1: On the road(map) to success! The second session of go_girl had a lot to live up to after the huge success of week 1. Unsurprisingly, however, week 2 proved to be another fantastic afternoon full of insightful discussions and fun activities. I was lucky enough to join the second group for session 2 this week, with JJ, Sophie, Rebecca and Abbey, which also meant being able to witness the debut of JJ’s brilliant go_girl mascot! 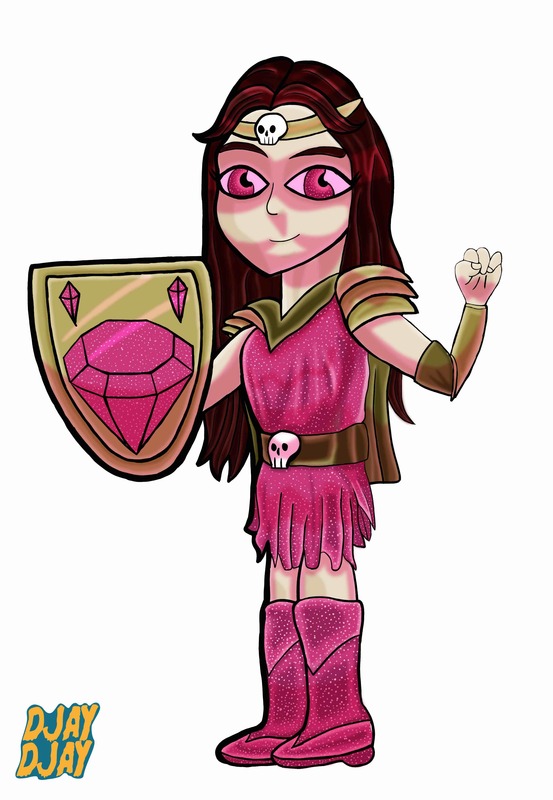 JJ has taken everyone’s input on board to create an uber impressive Xena warrior princess-esque emblem that really captures the strength and determination of the young women in the group. The grit that the team possesses became very clear during the group discussion about anxieties and worries. 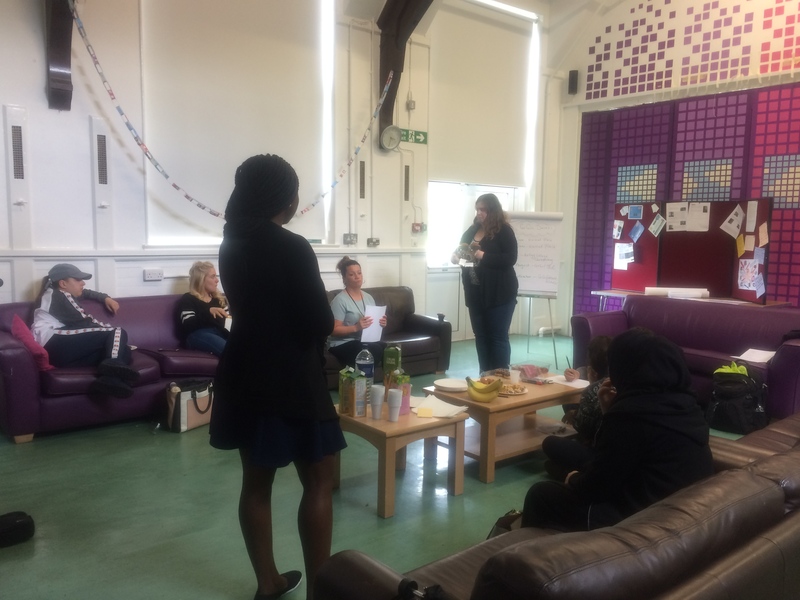 Through bravely sharing any concerns that they have, such as worrying about presenting in a group or feeling down on a go_girl day, the young women were able to support each other and come up with joint solutions to tackle these issues. This brought the team much closer together – as did the go_girls’ shared loved of animals! One of the young women was very keen to bring her new puppy into one of the sessions, so watch this space for cute dog photos in the coming weeks! Next we had the opportunity to share experiences of work, both positive and negative. 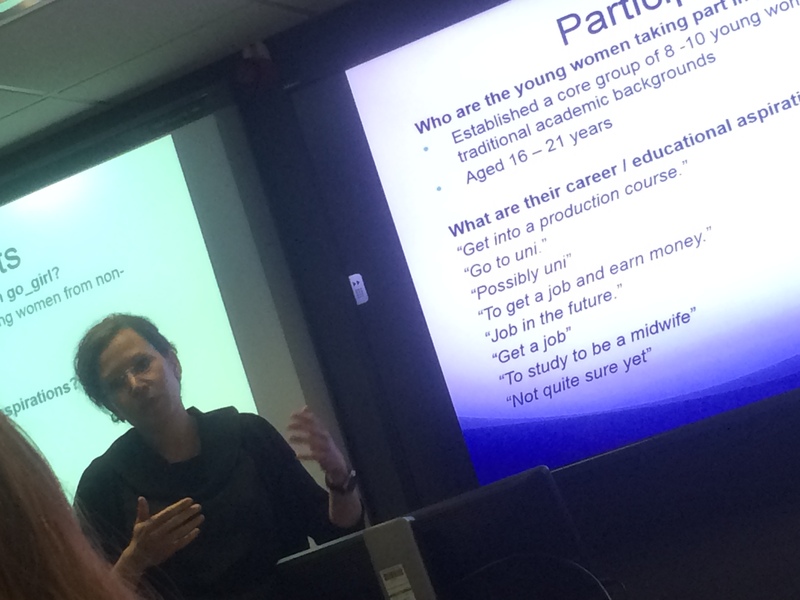 It was really interesting to hear about each young woman’s very different employment pathways. Most of the group had experienced some sort of bullying or belittling in the workplace, which had made them feel low in confidence. 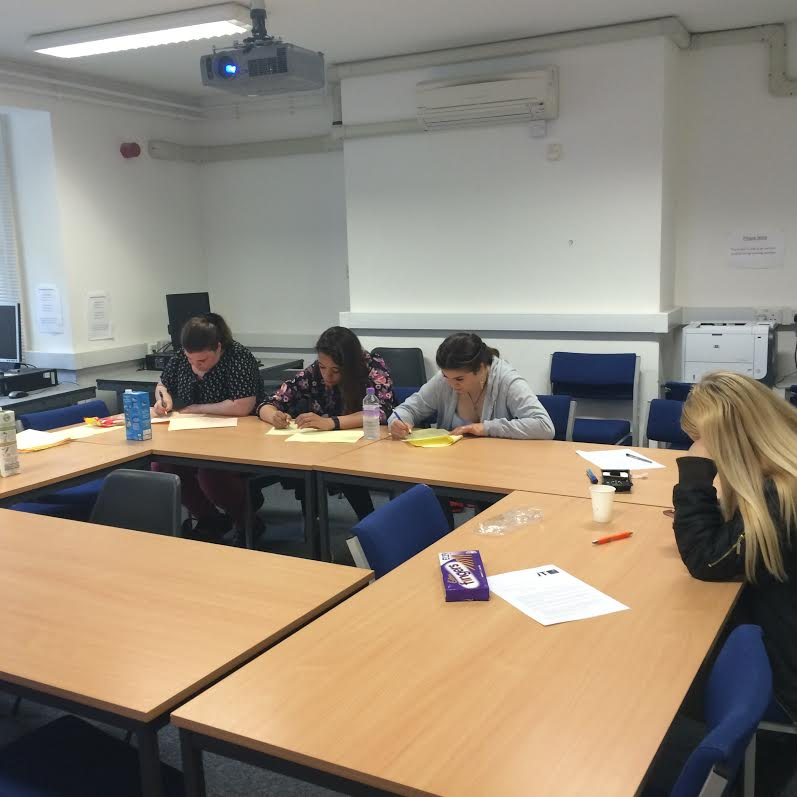 They all agreed that being in a supportive work environment would make a huge difference to their confidence. One of the young women has an induction for a new job this week, and is really hopeful that it will work out as the team there have been really welcoming. We will all be keeping our fingers crossed for Sophie over the next few days and wishing her all the best! Whilst a positive and empowering workplace is a must for all of the young women, each individual has very different career ambitions that match their own unique interests. Completing roadmaps detailing where the go_girls would like to be in two years time, and the steps needed to reach that goal, allowed the group to reflect on these differing needs. 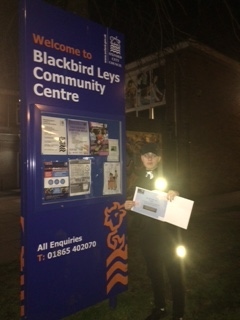 One of the young women, for example, would like to be in full time employment in two years time, and would like to have further training, help in writing her CV and a boost in confidence to get there. These plans will really help the go_girl team to provide tailored and effective support for each of the young women – I can’t wait to work alongside them over the coming months to help make their dreams a reality. 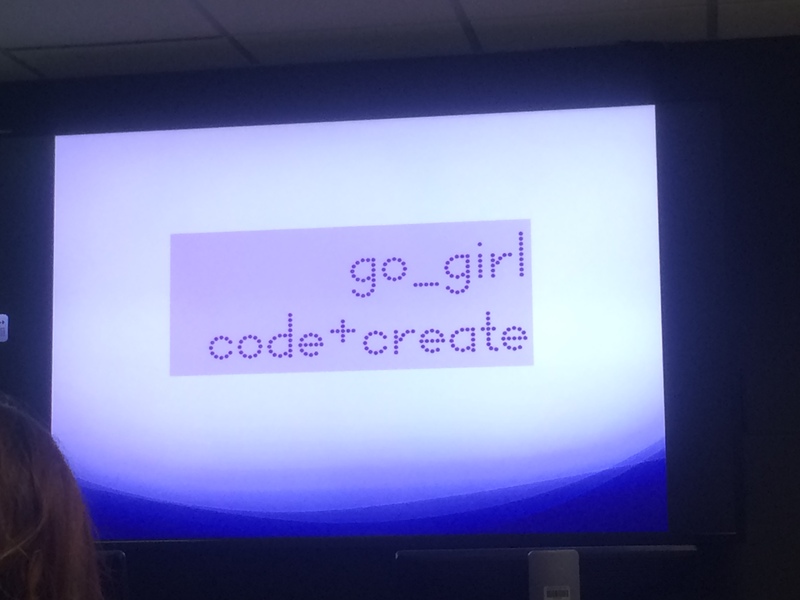 Session 0: First session for year 2 of go_girl! We’re so thrilled to be back with a new group of ambitious young women and had our first session of the year. We spent the session getting to know each other through different ice breaker activities, discussing everyone’s expectations and goals for the year and collaborating on what the go_girl mascot will look like. We have twelve girls to start with and plans to add more. Because of the increased size we’ve decided to split this year’s sessions into two per week instead of one so everyone gets the proper attention needed for their projects and skill development. When discussing each of the go_girl’s expectations and goals for being part of the team most said they were eager to learn how to make games, create empowerment blogs relating to things they’re passionate about, building confidence and overall skills. Everyone said they were looking forward to using what th ey learn with go_girl for their futures. Each go_girl brings a unique perspective and different skills that makes me look forward to the collaboration opportunities ahead. expressing what they would like included and JJ used all of the input to draft an amazing mascot! We’re excited to share it with you all when it’s finalised. The session went by quickly as usual but it was really productive. Each go_girl was given a notebook to use for reflection so they spent part of the last bit of the session writing in those. We ended with some lively discussions on various topics the go_girls are interested in discussing and learning more abo ut. A couple of them included cyber-bullying, privacy online, body positive messages and confidence building. These are especially pertinent topics today that are important to learn about and discuss. It will be really interesting to hear everyone’s experiences, concerns and proposed solutions! Next week we will begin individual roadmaps for each go_girl that will help outline their goals and paths to reach them. We will also dive into pseudo-coding! The recruitment process has been happening over the past few months now, recruiting and engaging girls and young women to start this years go girl code + create project 2017! 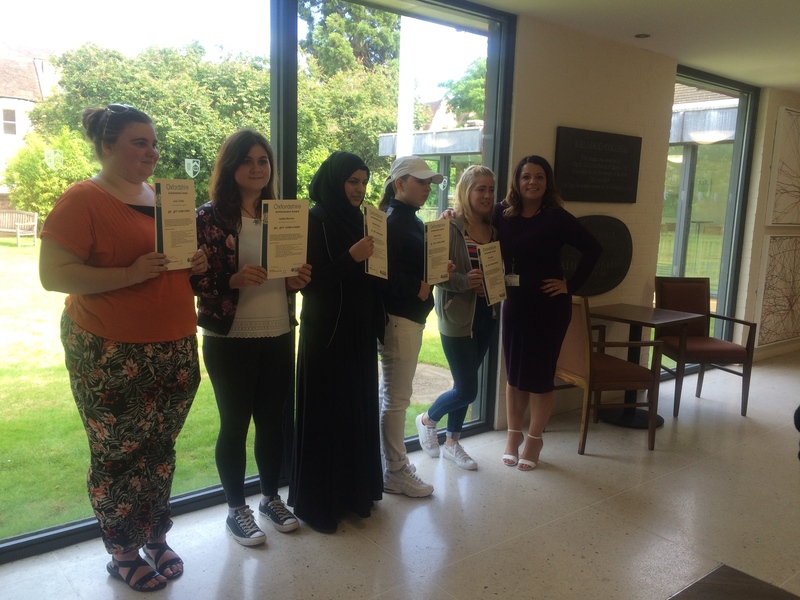 I have been fortunate enough to meet some inspiring and inspirational young women from Oxford and surrounding areas. We currently have 12 girls and young women keen to get started and join go girl. Ashmita, Paula and I met the lovely JJ last week who is incredibly creative and talented- we had a great catch up with her and she will definitely have a lot to offer the project. Me & Paige met Jade and Ebonnee in Oxford City Centre this week. We treated the girls to sandwiches and cakes and got to know them a little better. The girls expressed their interests in go girl and said they are really looking forward to getting started, meeting new people and experiencing something completely different in terms of a computer programme just for girls! Anne and I met with Abbey yesterday at the Department’s café. Abbey has already been thinking about creative ideas for the project and thinking about her goals and aspirations! I have been meeting each of the girls 1:1 each week to get to know them and introduce them to go girl, getting to know their expectations and what they are hoping to achieve from engaging with the programme. The girls and the team are very much looking forward to meeting one another next week- Wednesday 3rd May for the ‘Kick Off ‘ session getting to know one another, learning more about the project and introducing them to the beginning of the go girl code + create programme. 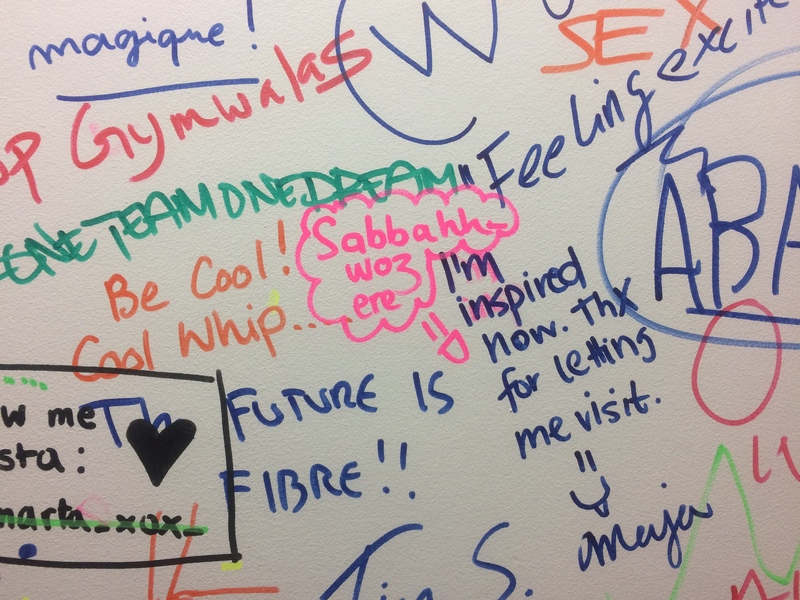 …and here is Sabbah’s message. 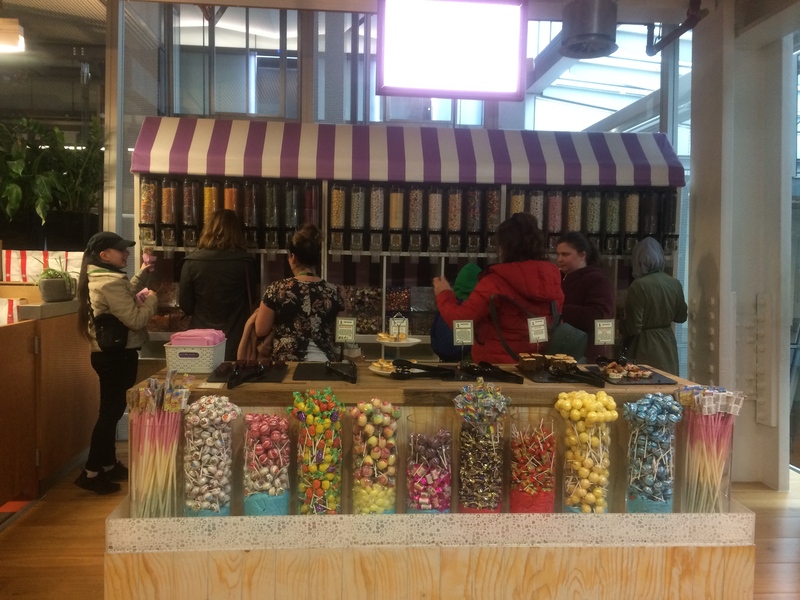 And, of course, one of the main attractions: the Facebook candy store with free sweets on offer! The recruitment of new participants for the next go_girl project cohort has started! 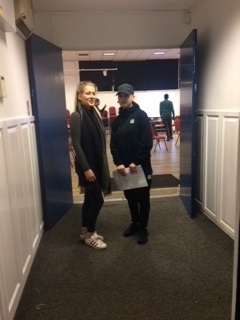 Two of our go_girl pioneers, Chloe and Rosie, yesterday joined youth worker Mel on her visit to youth clubs in Oxfordshire to introduce the go_girl project and to recruite new participants. 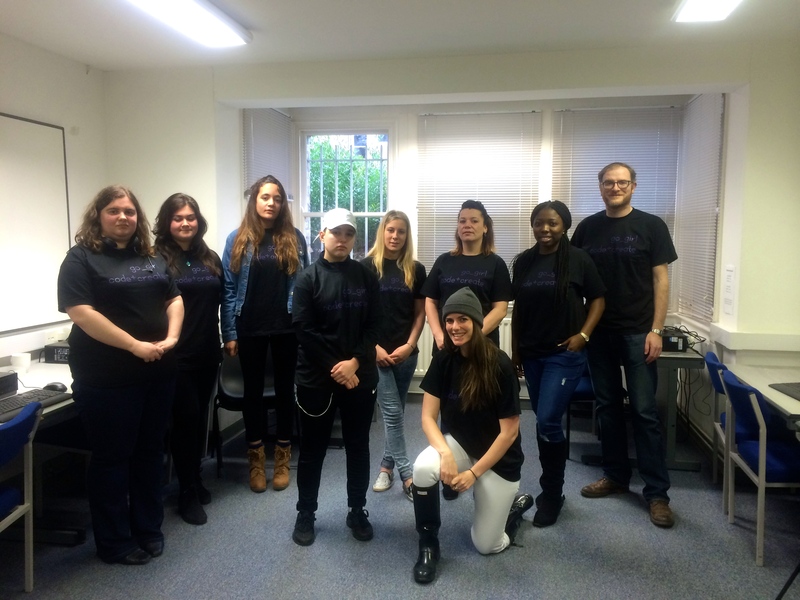 The go_girl: code+create project continues this year with a new group of young women! Over the next weeks, we are planning to start with the recruitment of the new participants. Some of the young women who completed the programme last year (the go_girl: code+create ‘pioneers’) will act as mentors for the new participants and will share their experiences and newly gained coding skills through peer-to-peer learning. 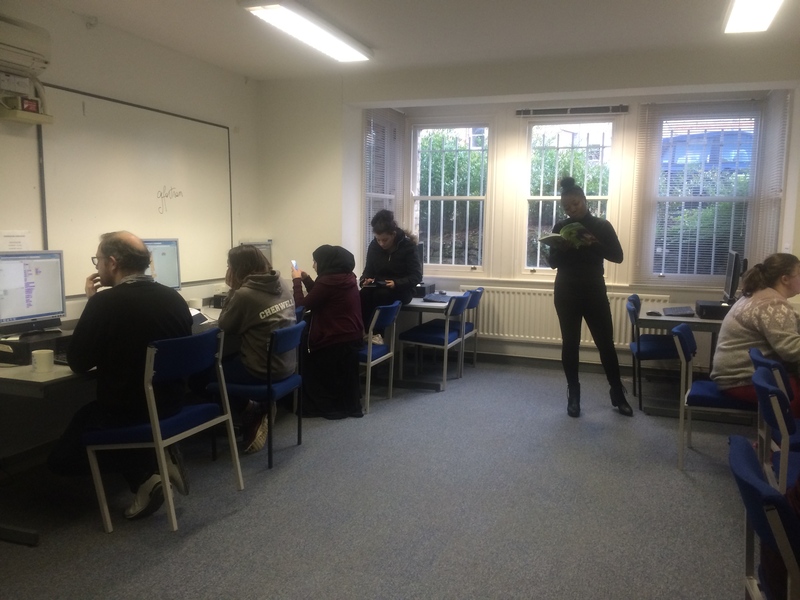 We are very grateful to our funders for this fantastic opportunity and are all very excited that our weekly coding sessions will start again soon. More updates to follow! Today, we celebrated our final project event! We all came together at Kellogg College to share the stories of our journeys over the past go_girl year with friends and families and to present the projects to those interested. Everyone seemed really impressed by the journey made since the start of the project in September 2015. 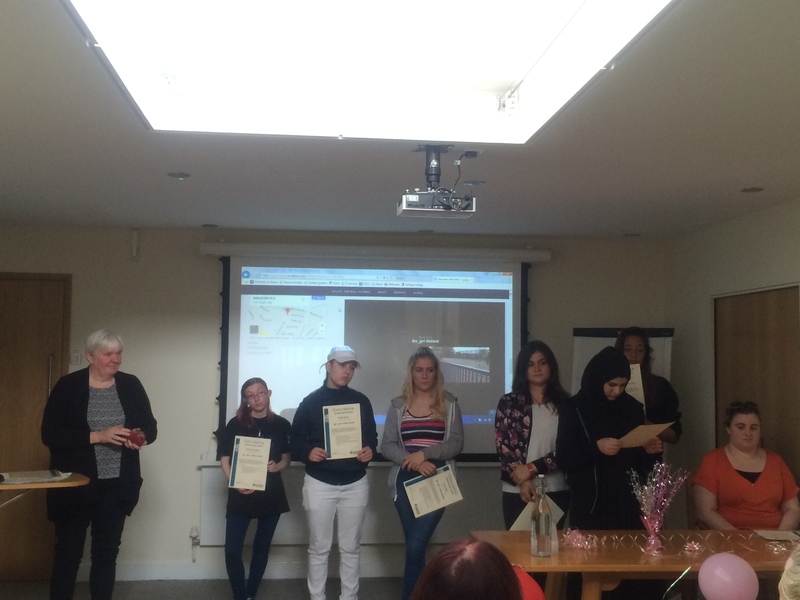 The young women received their AQA certificates and Julia got a special recognition for having attended every single one of the 35 classes and all additional events and outings since the project started! So what’s next for the young women? CE will start Sixth Form in September and is planning to become a midwife. RH is planning to become a youth worker, citing Mel as her inspiration, and will start the courses that lead her on that path in autumn. Both I and F are planning to become teachers. JT will embark on a computer course in September to learn more about computers and maybe even coding. C will continue her work in the foodbank and is planning to get a licence to drive a fork-lift truck. SR is becoming a mom in the next few weeks. J is planning to volunteer for an NGO radio station. And SB is planning to retake her A-levels to get into Uni to fulfil her dream of studying for a science degree. We are so proud of all of them and wish them every luck for their next steps. Go Girls! The go girl football fitness, in collaboration with Oxford United Women FC, which, initiated by Mel, developed from the go girl project, will resume in September and will continue. Mel will continue to follow up with the young women’s educational paths in the context of the weekly drop in session at the Early Intervention Hub. Niall and Anne will continue to meet and check in with the young women to hear about their plans and progress once a month until next year. Today was the last official go_girl session! It was very sad but wonderful to see how far everyone has come in the past year! We started the session with the usual check-in. 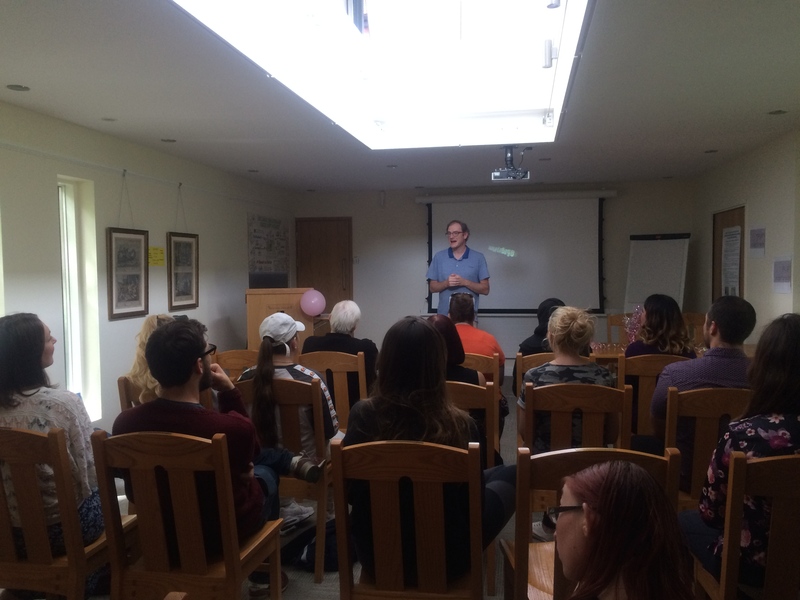 With the final go girl ceremony, which is taking place next Wednesday afternoon at Kellogg College, only a week away, we had a full program. The main goal of today’s session was to complete our roadmaps, which detail our educational- and career goals depending on our own plans and circumstances, and which outline the next steps that we need to take in order to achieve these goals. 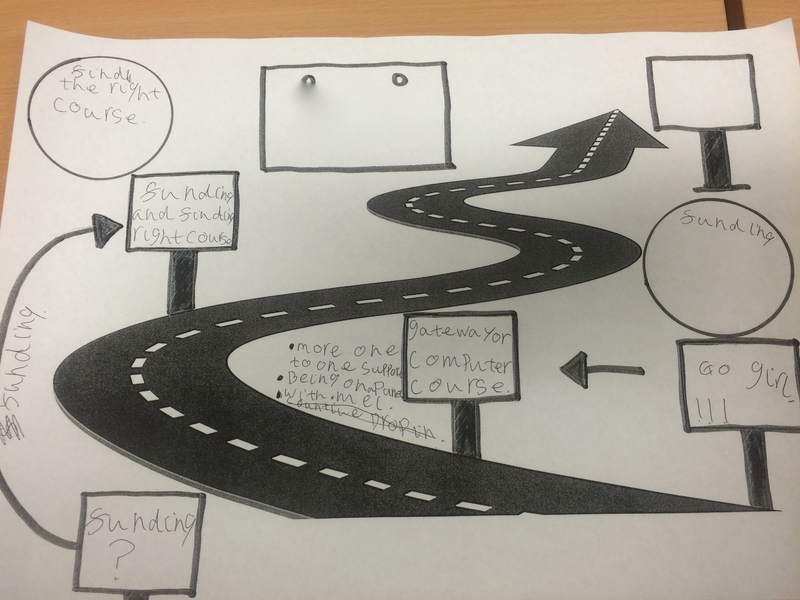 We used a template with a road that allowed us to plan for each next step where we need to get information from, to write down what challenges we might face and how to overcome them, and where to get support and help from should we get off the road. For each of these factors there were different fields to fill in for each step. 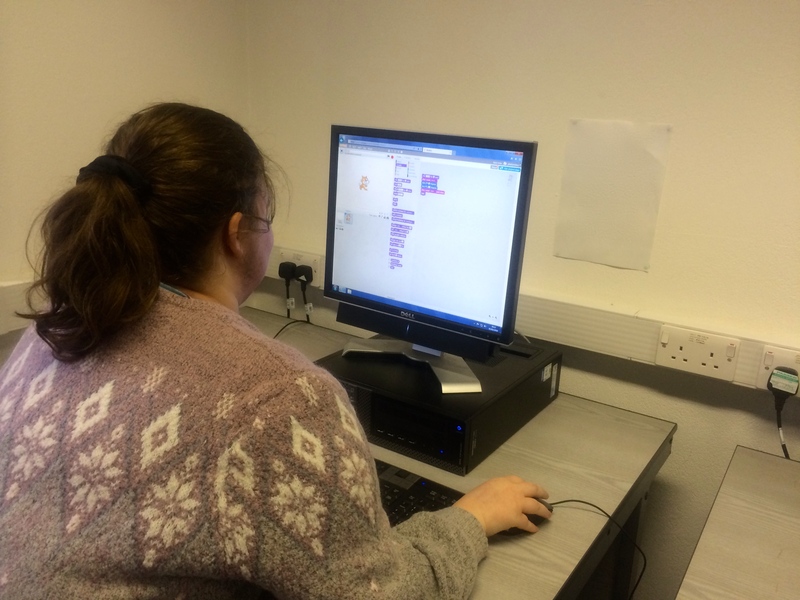 Despite the official coding sessions of the go girl project at the Department of Education coming to an end next week, Mel will continue to follow up with everyone at the Early Intervention Hub for the next few months, to support them and help everyone achieve the goals they have set for themselves. Next week, we will showcase our projects and speeches to our families and friends in our final Go Girl Awards Ceremony, and will also receive our AQA certificates. It will be good fun! The session started today with the girls talking about their previous week and sharing what they have done over the recent weekend- JT shared with the group some photos of her cousin’s wedding she had attended Saturday. The girls completed two questionnaire’s each- these were questions about their individual experiences with internet skills, confidence and internet safety. One of the questionnaires was for the girls to answer how they felt prior to go girl and the other was about there experiences now. The girls then began to continue with the work they started last week in regards to the go girl ceremony on the 6th of July. Chloe prepared the programme for the ceremony and Sabbah and Julia worked on completing the invitation. They found images of Ada Lovelace that they thought would be great to use on the invitation. Frances and Isabel completed the flyer last week, the flyer is now ready to be printed and shared with family and friends. 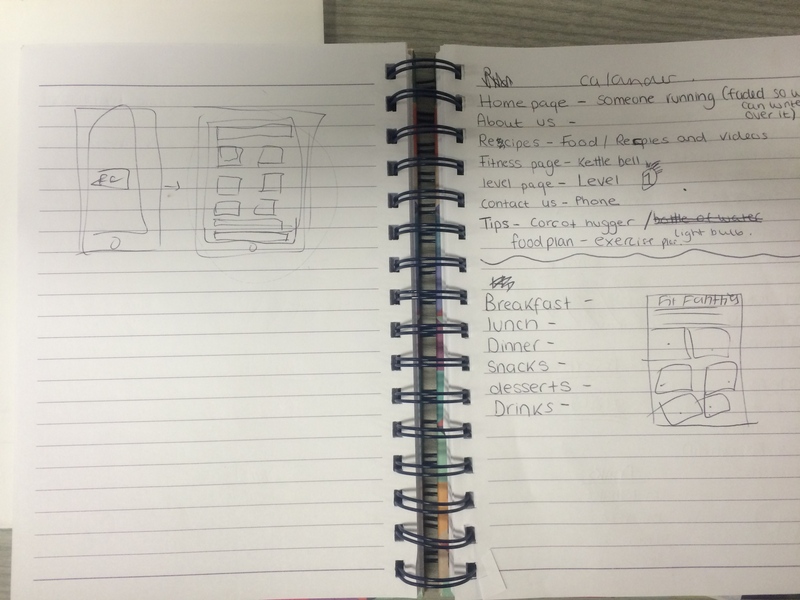 Isabel and Frances continued to work on their app adding food diaries and fit tips. 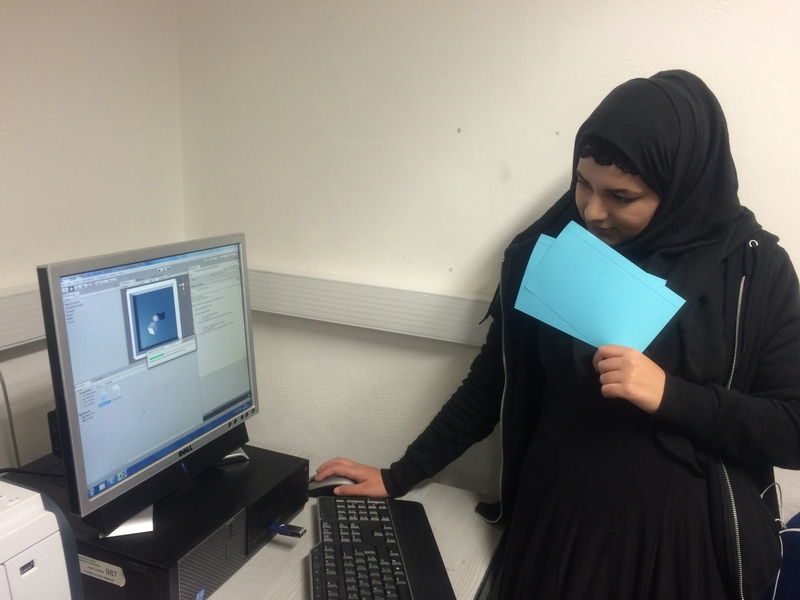 Sabbah continued to work on her game- Dinosaur v Dinner adding script to the software and developing the character. Chloe added to the go girl football fitness website- letting people know the dates and times of the next football sessions this coming September. The website is looking great and both Chloe and Rosie will continue adding to it over the summer period. Today the go girls got together at the East Oxford Hub. The group discussed last weeks event at the symposium and shared their thoughts. 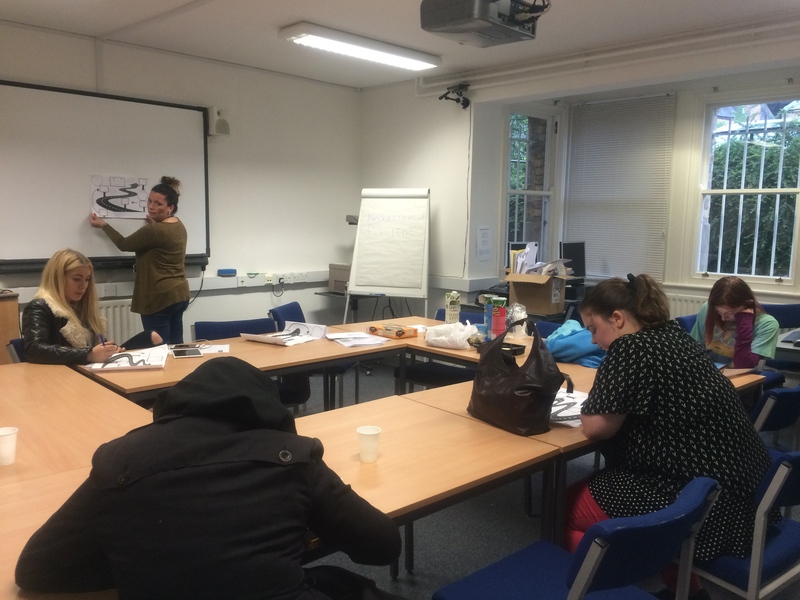 The group discussed the next steps for go girl and what needed to be done for the go girl ceremony which will be taking place at Kellogg College on 6th July 2016. The girls started to plan for the ceremony and got into pairs to design the flyer, programme and invitation for friends and family members. The girls and young women appear to be more confident in expressing themselves and feeding back to others about all of the fantastic work they have been doing! 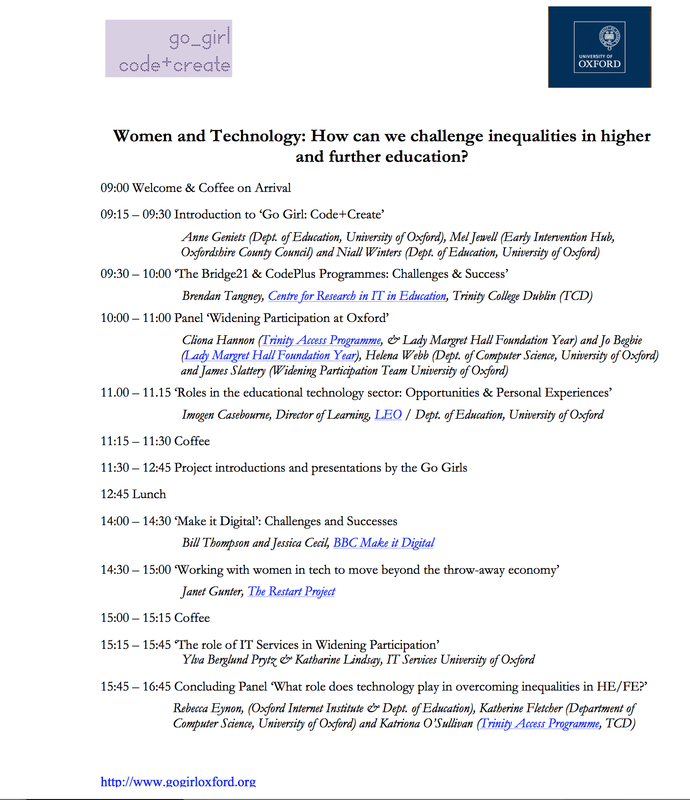 Today’s symposium on ‘Women and Technology: How can we challenge inequalities in higher and further education?’ started with an introduction by Niall Winters, in which he welcomed the around 36 delegates and set the frame for the day. 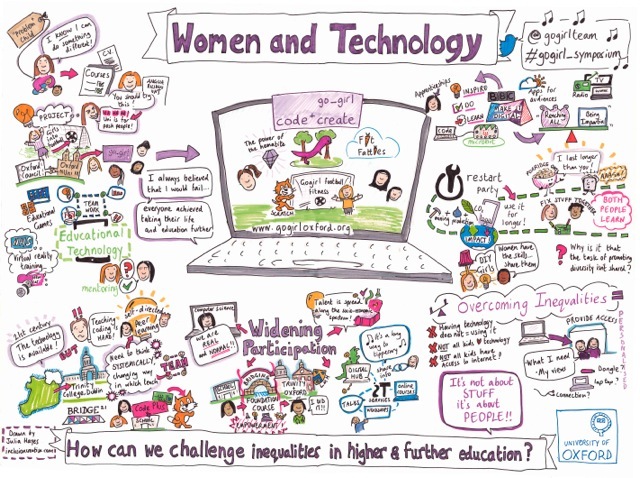 Referring to the diverse talks and panels ahead, he emphasised the need to address issues of inequality for women in technology and the necessity for ways forward with regard to overcoming barriers in higher and further education particularly for young women from non-traditional academic backgrounds. 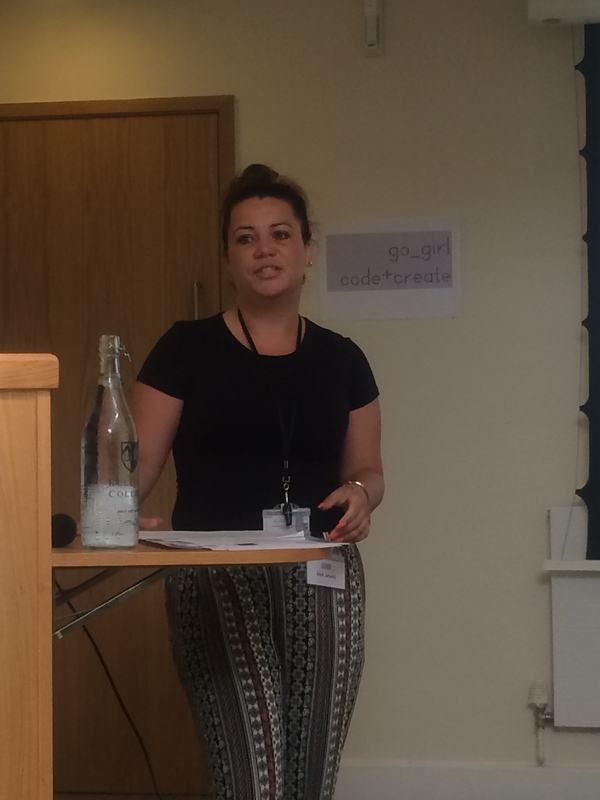 Niall’s welcome was follwed by Mel Jewell’s introduction to go_girl:code + create. 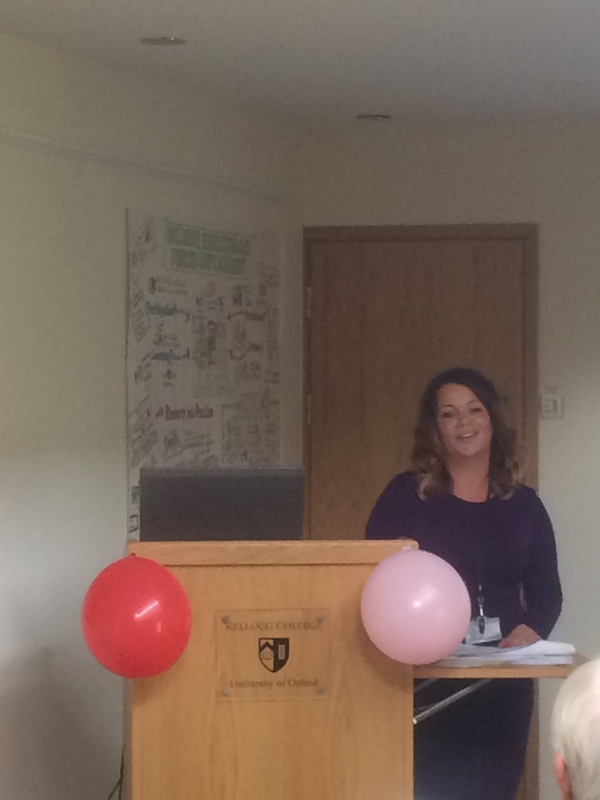 In an inspiring speech, Mel reflected on her personal experiences of raising two boys as a single teeange mom and on how, having learned how important it was for her to have a role model in her local youth worker, she came to be a youth worker herself. Mel was followed by short introductions by Anne Geniets and Paula Fiddi, and the introduction of Julia Hayes of Inclusion Creativa, who drew today’s brilliant symposium graphics. Anne and Paula introduced the aims of the go_girl project, which are: to understand barriers and challenges facing young women from non-traditional academic backgrounds when applying to HE/FE; to increase overall IT skill levels through media production (video, music, blogs) and creative programming and coding; and to increase academic confidence. And they outlined the three project phases, which are: Phase 1 – aspirations and life skills; Phase 2 – IT skills and creative projects; Phase 3 (current phase) – coding and mobile apps. Brendan Tangney, Professor of Computer Science at the Centre for Research in IT in Education, Trinity College Dublin (TCD), was next up, introducing both the The Bridge21 and CodePlus Programmes for Girls projects in Ireland. Brendan emphasised that just improving coding skills of pupils won’t work if not simultaneously resources are invested into training teachers in IT skills and coding. 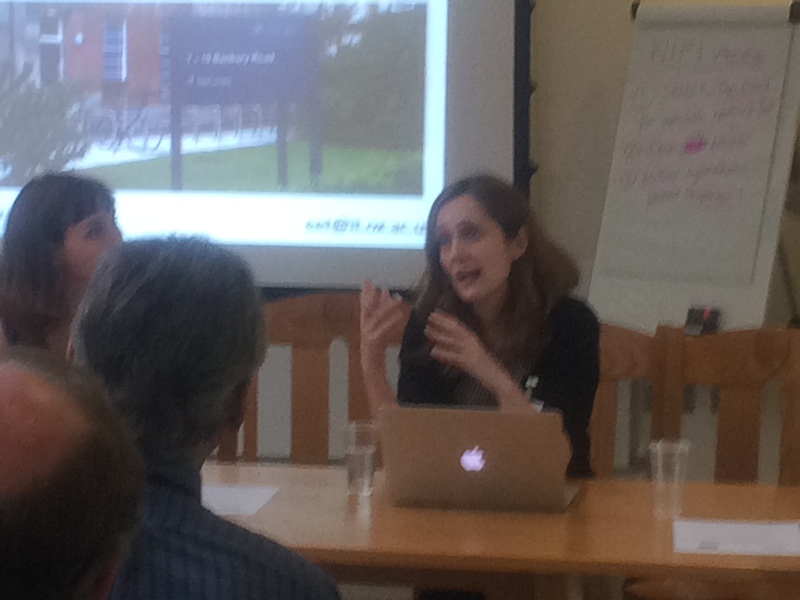 Brendan was followed by a panel on ‘Widening Participation in Oxford’, which included Cliona Hannon from the Trinity Access Programme and the Lady Margret Hall Foundation Year and Jo Begbie from the Lady Margret Hall Foundation Year, Helena Webb from the Dept. of Computer Science, University of Oxford, and James Slattery from the Widening Participation Team University of Oxford. 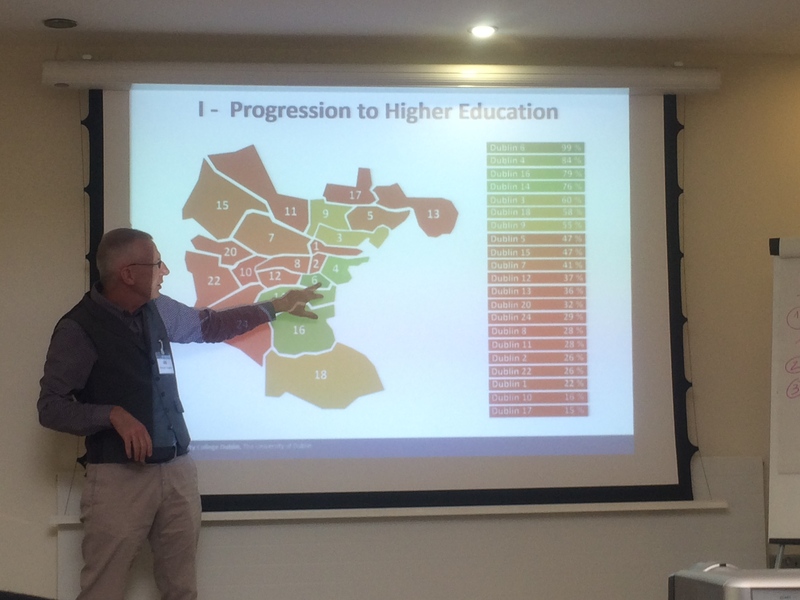 All of the participants emphasised the need for improved access to higher education and to Oxford for young people from non-traditional and low socio-economic backgrounds and women. Barriers and challenges were discussed for young people from non-traditional backgrounds, and how programmes like TAP or the LMH Foundations Year and efforts by the Department of Computer Science and the Widening Participation Team at the University of Oxford were trying to tackle these issues. There seemed to be a consensus that in recent years, there have been increased efforts to reach out to and to encourage young people from non traditional backgrounds and for women to apply, as evidenced by a number of initiatives at Oxford such as the ones presented by the panelists. Next up were the go_girls! 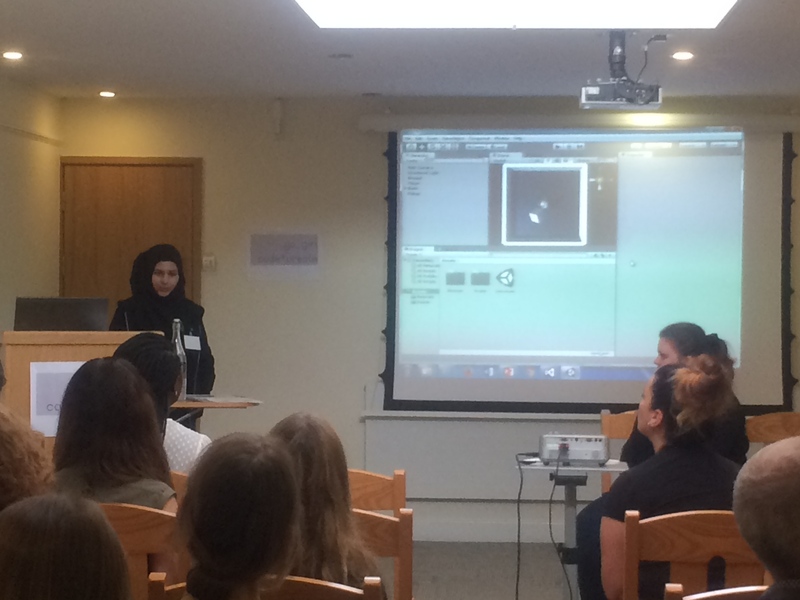 Introduced by Paula – Julia, Sabbah, Chloe and Rosie did a fantastic job introducing their coding projects which are still ‘work in progress’ at this stage, and not yet finished. It took a lot of courage for them to stand for the first time in front of such a big audience, but all their hard work and month long preparation of their speeches and presentations completely paid off: Their stories really touched the audience! Frances and Isabel couldn’t make it, so Paula presented the power point presentation of their project which they had prepared in the run up to the event. Imogen Casebourne, Director of Learning at LEO was up next, talking about the roles in the educational technology sector and reflecting on her personal experiences working in the educational technology sector. 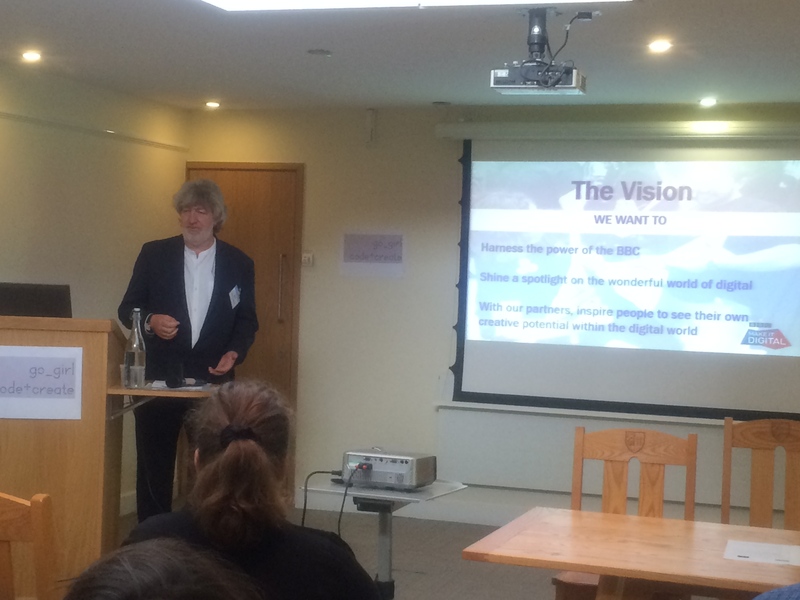 After lunch, Bill Thompson from BBC Make it Digital kicked off the afternoon sessions. He introduced the BBC’s micro:bit initiative and he had brought along one of the micro:bit to demo and for the audience to try. 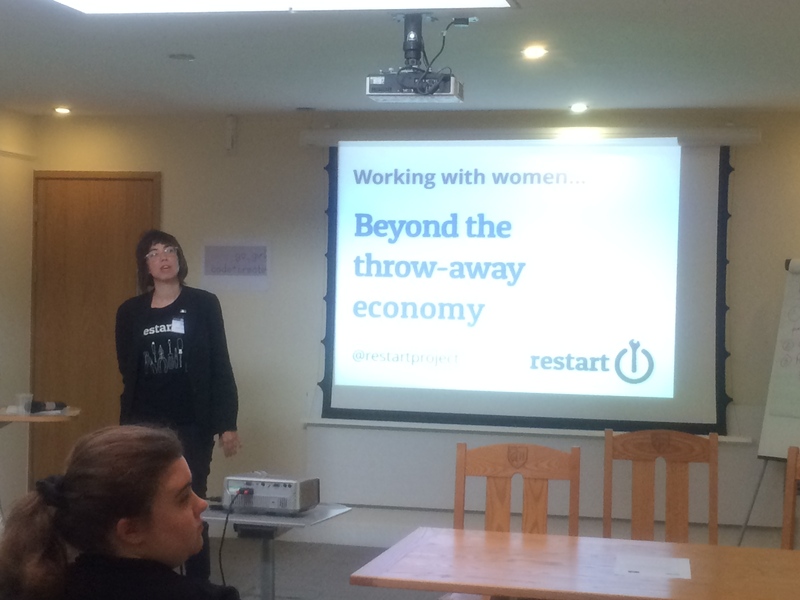 Bill’s presentation was followed by Janet Gunter, co-founder of the The Restart Project, who reflected on her experience of working with women in tech to move beyond the throw-away economy. Janet presented startling figures about our electronic waste and made a very strong case for why women should try and tinker more and fix their own equipments. 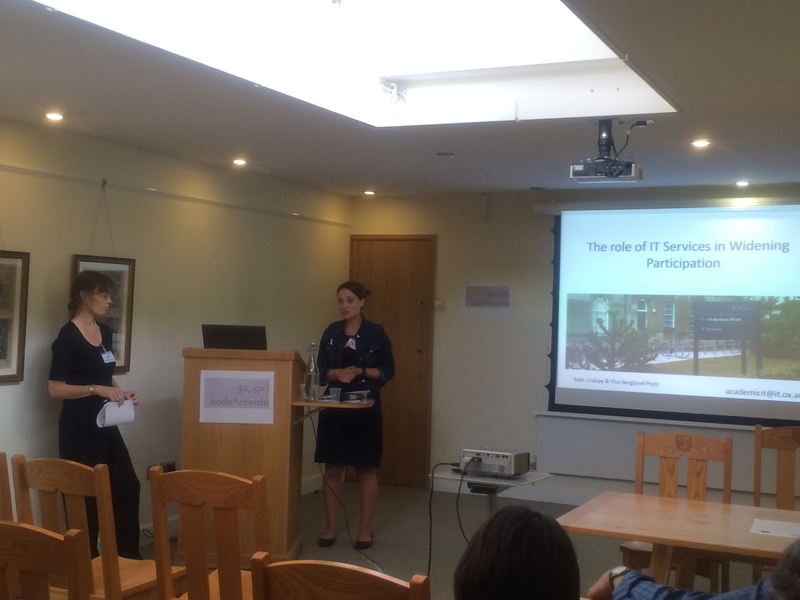 Next up were Kate Lindsay and Ylva Berglund Prytz from the IT Services of the University of Oxford, who reflected on the role of IT Services in widening participation and shared some of their personal experiences working as women in IT. Rebecca Eynon, Associate Professor at the Oxford Internet Institute and the Department of Education, and Katherine Fletcher from the Department of Computer Science at the University of Oxford concluded the symposium by summarizing the day and by discussing together with the audience what role the technology can play in overcoming inequalities in Higher and Further Education. 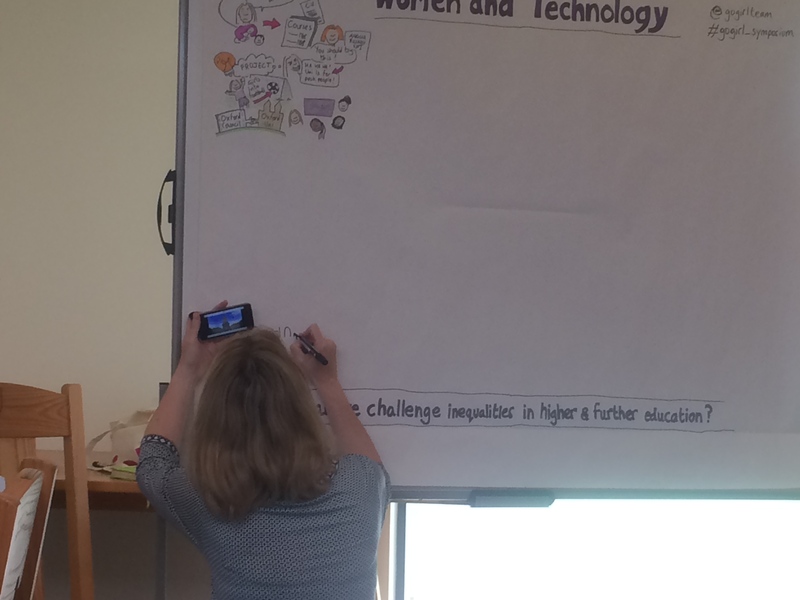 To conclude, the variety of perspectives of the day was very welcome and it was great to see the breath of work undertaken to address issues of inequality for women in technology and in further and higher education. Despite the breadth and width of perspectives, there seemed to be wide consensus among the audience that technology alone cannot solve the issue of inequality – indeed may even amplify existing inequalities, but rather needs to be understood as an instrument that may help address the issue. Today’s session was all about giving our presentations the final polish and gaining that bit of extra confidence to present our projects to an audience. We started the session by doing some funny vocal exercises to learn how to project our voices better, and then by rehearsing the presentations we had written to showcase our (still not fully finished) projects next Wednesday at the go_girl Symposium. 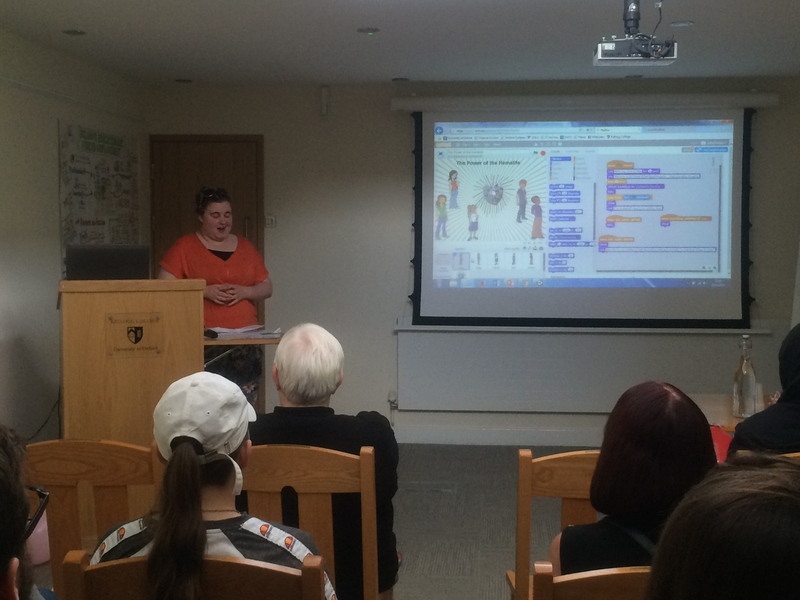 We then presented these talks & presentations to the group: each project team demonstrated their game/app/website, walking the group step by step through their games/apps/websites. It’s only a week to go now! We are all a bit nervous, but the presentations went really well today and it will be a great opportunity to showcase the projects to a wider audience. In today’s session, we continued to prepare our project presentations and to finalize our projects. It’s only two weeks till we will present our projects for the first time to the public! We may not be fully finished with all the details of our projects by then, but the projects are making good progress and we will aim at getting them near to completion. In today’s session, Julia continued to add characters and themes to her Scartch game, while Charlotte got started with designing her game and with developing a narrative for it. Meanwhile, Frances and Isabel continued with their mobile health & lifestyle app. They have decided to look for another software to use instead of Mobincube, as they were looking for specific features and functionalities of the software. It’s very exciting to think that there are only two weeks to go till we will present our projects! Session 30: Woo-hoo! Thirty sessions done! After thirty Go girl sessions, it’s amazing to look back and see how far the girls have come. They have been committed to the project, putting in as much effort as they can. The improvements, the friendships and knowledge of new things have made all sessions worth it! In today’s session, after our usual check-ins, we were joined by Tom and Mya from the University of Oxford Impact Team. They came to film and document what we do during our sessions as well as interact with the girls one-on-one. The documentary involved short interview sessions with some of the girls, talking about their experiences with Go girl Oxford so far. While the video interviews went on, the others continued working on their projects. Julia: spoke to Tom and Mya before working on her game. She introduced a different level of the Hematite game using Scratch, with more characters and improved interactions between them. Chloe & Rosie: edited their video interview with Demi (a football personality) and uploaded content to the website. Rosie also agreed to be interviewed and added to the documentary. 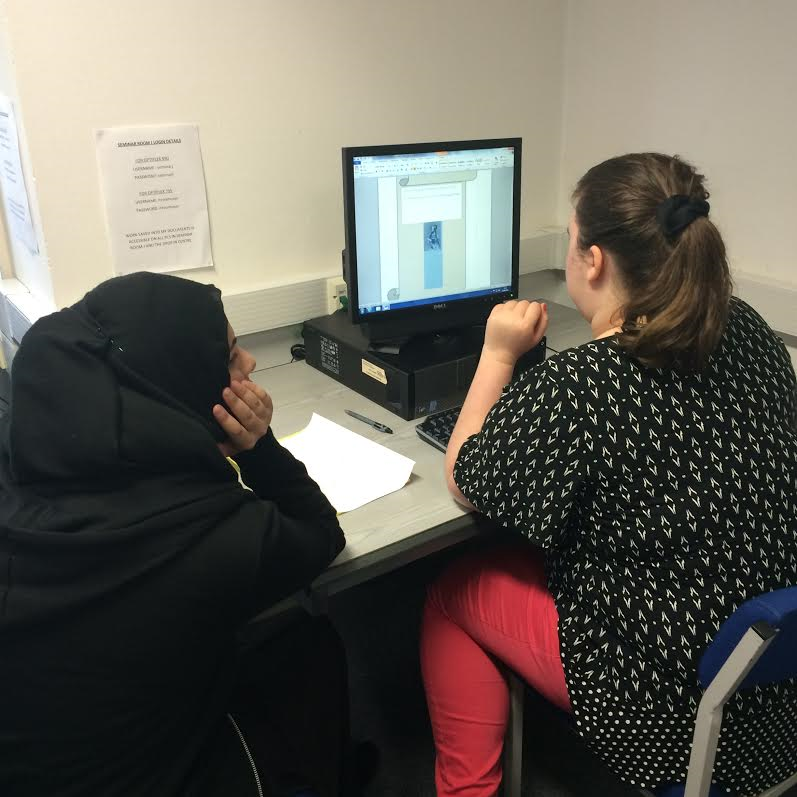 Sabbah: continued working on the codes for her game after her interview with the Impact team. Isabelle: worked alone today (Frances couldn’t make it). She started adding the recipes and exercises typed out earlier to her Fit Fatties app on Mobincube. Just like we did in our last session (Session 29), the girls were encouraged to practice presentations and public speaking using an ice-breaker public speaking task done towards the end of the session. Each girl picked a paper from the cup of mystery topics and spoke on whatever topic was stated in the paper they chose – using a set of guidelines. 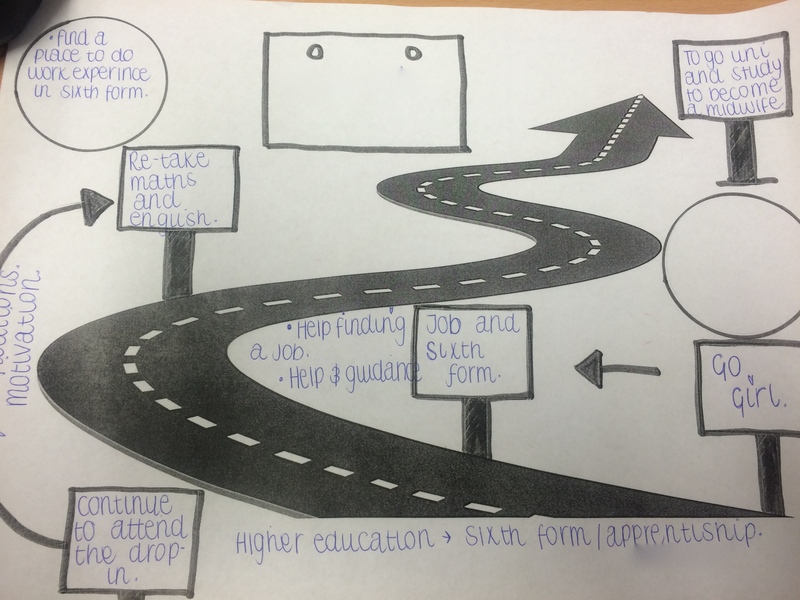 This task gave the girls an idea of what a presentation flow would be like. These practice exercises will continue as the girls continue working on their projects. As the project presentation date draws closer, the girls are ensuring that they put in much effort to see their projects through to completion. Today, we started with our usual check-ins from the past week and discussed with the team the Women & Technology Symposium happening next month. 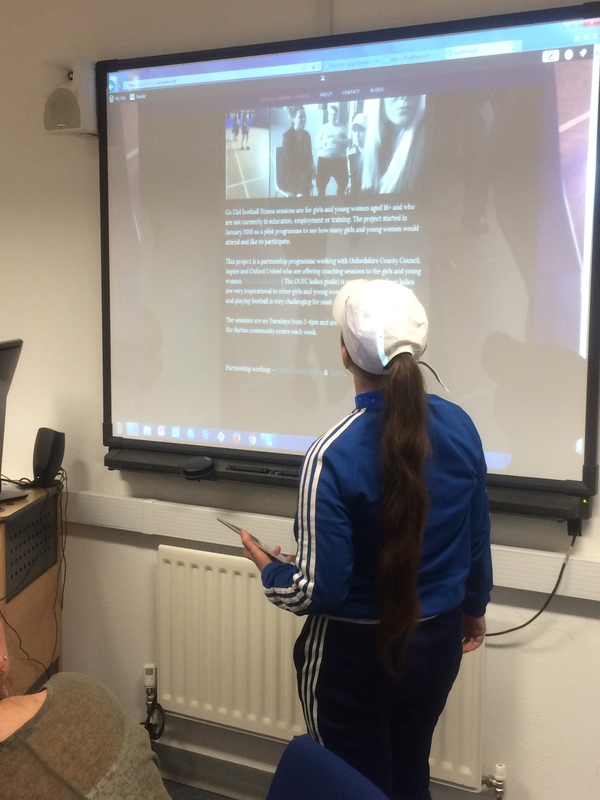 Rosie & Chloe continued with their Go girl football fitness website using WordPress; adding content like training plans from past sessions and refining already existing information on their website. Frances & Isabel also started adding content to their health and lifestyle app. They worked on food plans and exercise activities. Julia worked on her game and finished the first level. She will be introducing more characters and activities to the next level of her game by our next session. Sabbah decided to switch up her original idea of a dinosaur game since Unity 3D offers her more features. She continued writing short codes on Unity 3D to add more functionalities to her game. At the end of the session, the girls were asked to give short presentations to the whole group – about the essence of their projects and their experiences. These presentations will be done for consecutive sessions to allow the girls practice for their public presentation during the symposium in June. Today we kicked off the session seeing how the girls’ week has been and sharing any updates. Two of the girls have new employment opportunities which is great news and they both will be starting their new roles this week. The group discussed what work they had done over the previous week in regards to their individual projects and what work they were going to do today to move forward with this. 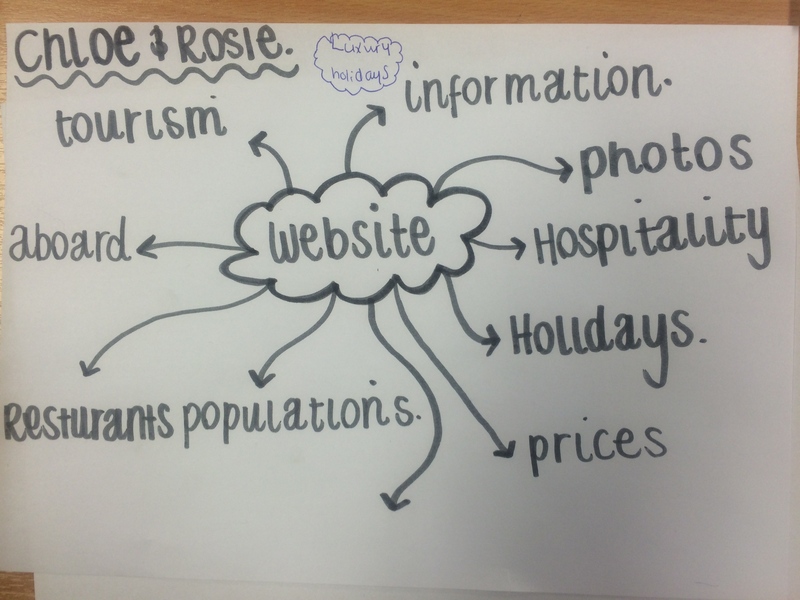 Chloe & Rosie: The girls started designing the web page for their project. They have found and secured a domain name and got started adding information about Go girl football fitness onto their new web page. You can follow their work-in-progress here! 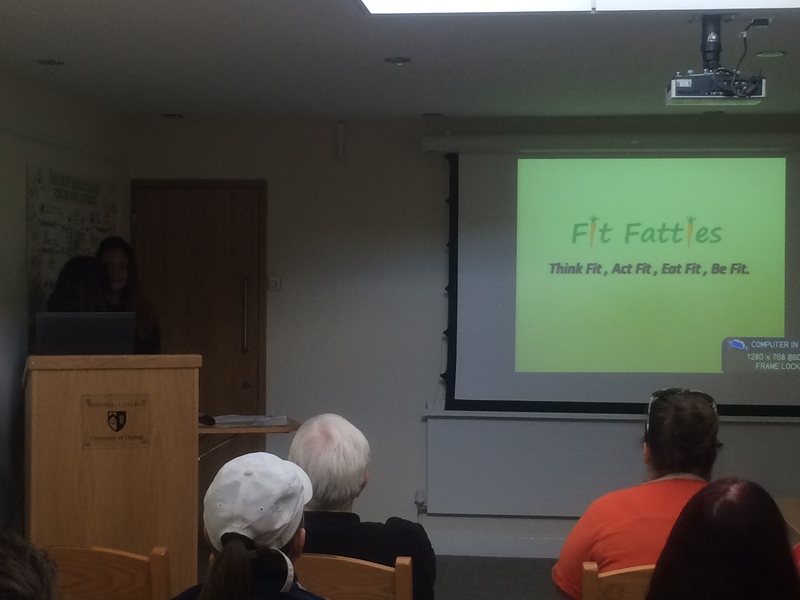 Isabel & Frances: These two were working towards finding the right tool to use to input information for their health and lifestyle app which they have named ‘Fit Fatties’. 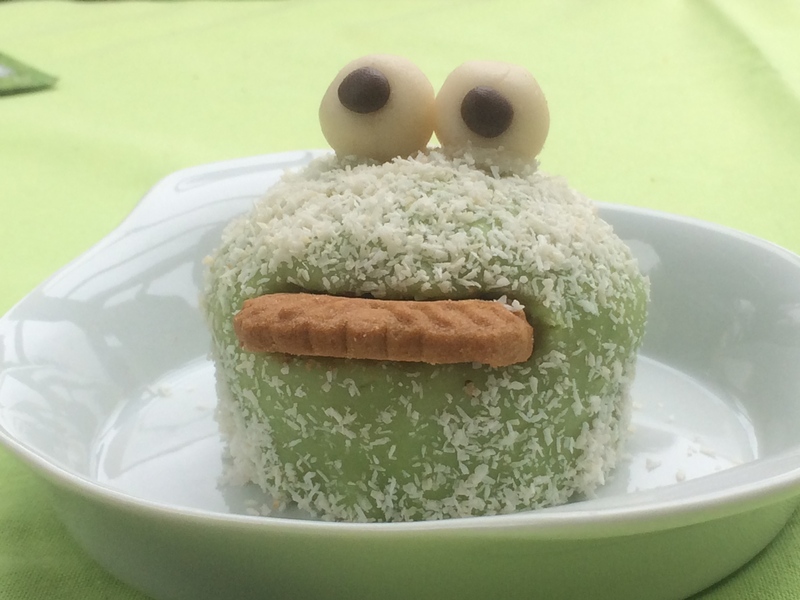 They initially had planned to use Appy Pie, but after some research have now decided to use Mobincube instead, as they find the software better suited for their purpose. They both completed and are happy with their chosen logo. Today, they both continue to research and look at other apps similar to the one they are designing to get ideas for their own. Sabbah: Sabbah continued to use Unity3D which she will be using to continue the design and format of her game ‘Dinosaur v. Dinner’. The long break is over and we are ready to start working on our personal projects! 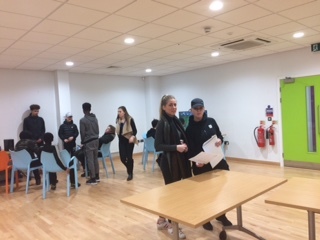 Today’s session started with our usual check-in and everyone seemed to have had a nice holiday- Sabbah in Egypt, Paula in Dubai, Anne & Niall doing fieldwork in Kenya, Julia’s birthday lunch outing, Go_girl football matches and so on. A market research (identifying what similar websites/apps/games they can find that are out there already). Explain how their projects differ, why it is better and what it offers compared to similar projects out there. After the set time for background research, each group or individual did a short presentation to the rest of the Go_girl team, reporting their responses to the given tasks above, results from their research and final plans for their project ideas. 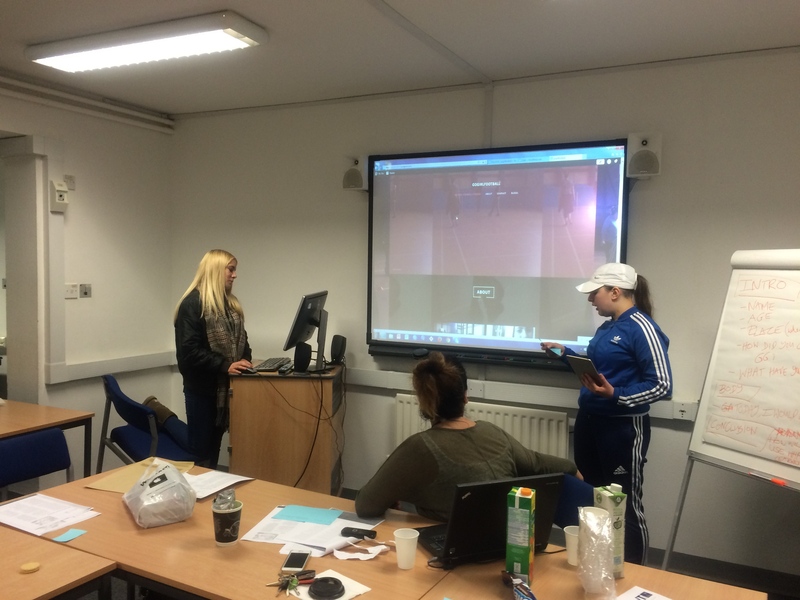 Rosie & Chloe – will develop a “Go_girl Football Fitness” website. Frances & Isabel – will be looking at technologies to develop mobile applications and will work on a “Health and lifestyle” app/website. Julia – intends to re-create and combine four (4) of her favorite games into one (1) game. Jess – wants to design a media project for young people facing several issues in the world today. Sabbah & Shannon – will design a “Dinosaur game” using Scratch and probably some other advanced programming tools. Charlotte – will be creating a game related to cancer, to teach young people about cancer issues. The session ended with take home assignments and a list of expected deliverables for our next session. 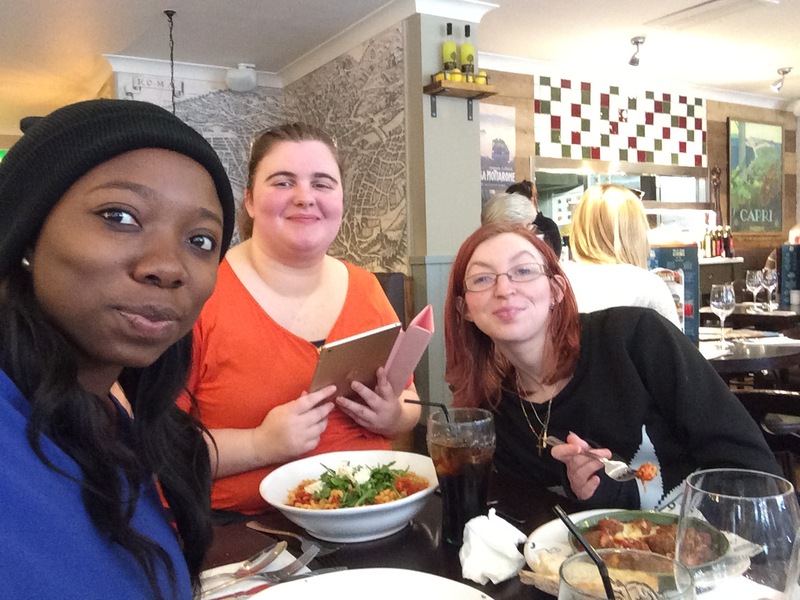 Session 25: Go Girl lunch date! 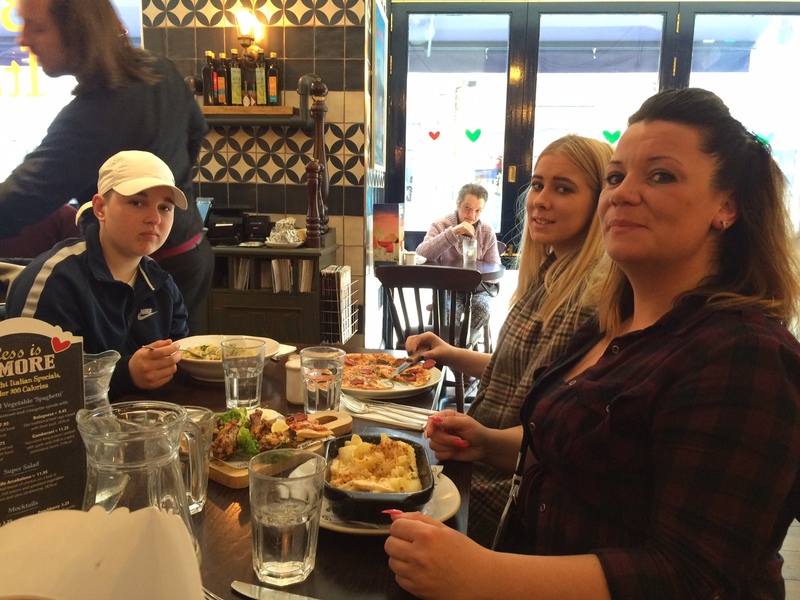 Today the Go Girls went to Bella Italia, Oxford City centre to have lunch and to Celebrate JT’s Birthday and the progress the girls have made to date during the Go Girl group sessions. 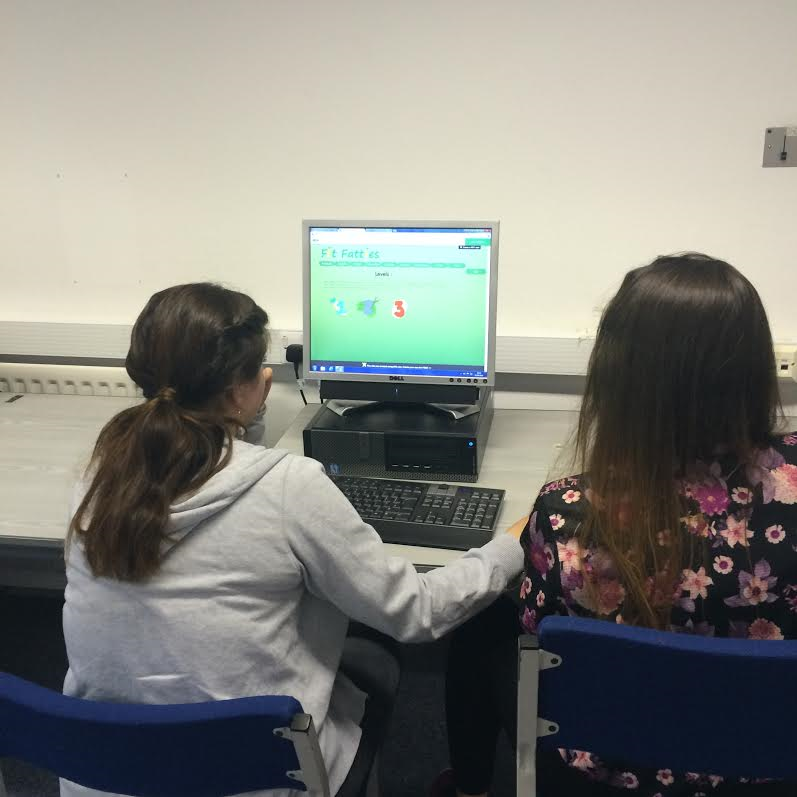 In todays Go Girl session I started my individual project of making a game using Scratch. I brainstormed some ideas on a piece of paper of what I would like my game to be, then I worked with Niall and he helped me start the game off. Next session I will continue to build the game up. As is tradition by now, we started today’s session with our usual weekly check-in. Julia, Sabbah and Shannon updated those who could not attend last week about the session and gave examples of the domain name they chose. We then had a discussion about what and what not might be useful things to post on our blogs for potential employers to see. Things like new skills acquired, program in our coding, visits to job fairs etc. might all be good things to put up there, even if it’s just a picture of a visit to a job fair. 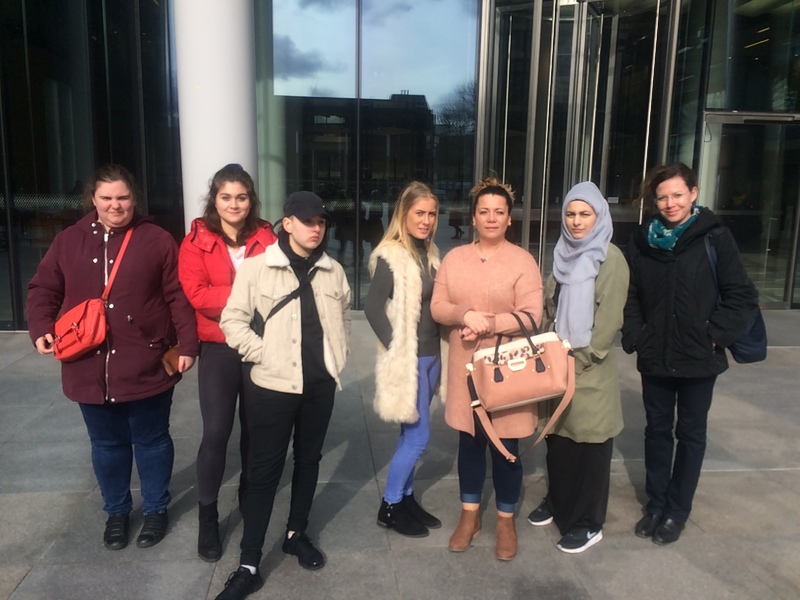 Sabbah, Shannon and Julia, who had already set up their blogs, then proceeded to write their first blog posts, w hile Chloe, Rosie, Frances, Isabel and Charlotte went about to find a domain name and set up their own blogs. Sabbah’s blog can be found here, Julia’s blog here, and Shannon’s blog here. (The links to the other blogs will be posted here as they become available). It was a good session and everyone worked very focused and efficiently. In the next session, now fully equipped to journal our coding journey, we will continue to code with Scratch, building an interactive holiday card for the upcoming holidays, and will work on refining the ideas for our individual projects. After a successful bake sale yesterday morning at the Department of Education, we were tired but excited that we raised some money for Paige. We would like to use this medium to say a big “Thank you” to everyone who was involved in our Cake sale activity – everyone who baked the amazing and beautiful cakes, those who bought our delicious cakes and those who generously contributed. We appreciate you! During our afternoon session, the Go_girl team had a great time creating our online journal/blog. Paula introduced the girls to wordpress.com to create their digital journal for expressing their interests, experiences and skills. We learnt that building the right online presence (within or outside the regular social media apps) is a good way to show potential employers or school admission officers our IT skills and more information that might not fit into our resume/cv. The girls also learnt the importance of using privacy settings, disabling comments, what kind of information to share or post on their blogs to protect their digital self. Each girl would be updating their online journal in parallel to learning how to program using Scratch. Next session, we will work on some Scratch exercises and update our blogs about our newly learnt programming skill. Please do come along and enjoy a cup of coffee or tea with a slice of freshly baked cake! We started today’s session with our weekly check-in and then Sabbah and Julia briefed the others who had not been there when we had talked about robotics (session 19) about the basics of the game they had learned. We also briefly discussed the individual creative coding projects, with which we will start next week. Some of the young women would like to develop a mobile phone app that is related to nutrition, others would like to design a game, and one group has not yet decided what they would like to do. We will discuss ideas for potential projects next week in more depth. Next, we all signed up to Scratch on the computer lab PCs, creating our usernames, and then got started with exploring the program. 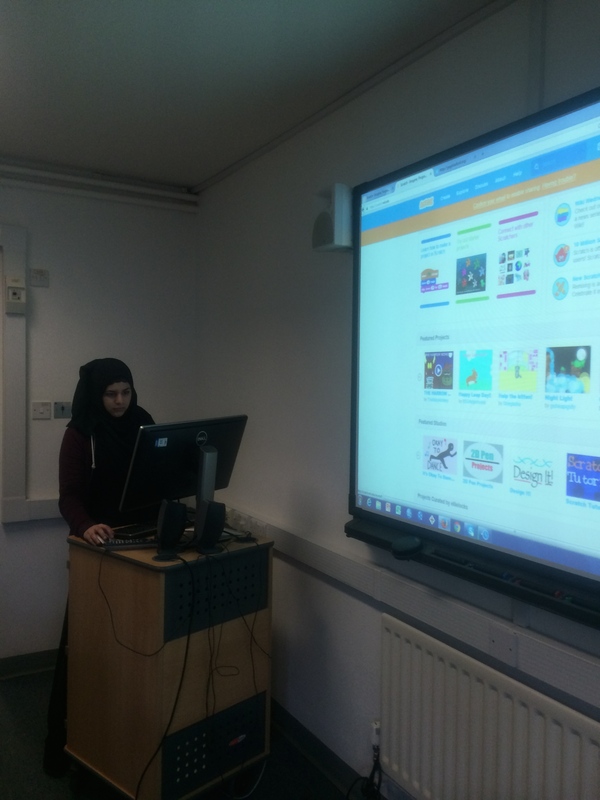 Everyone seemed to have brilliant fun programming with Scratch, as it is so easy and straight-forward to use! It allowed us to use the basic principles of coding, which we had learned and practiced in the Pseudocode exercises in the past few weeks, and to see them applied in a ‘real’ program. We worked at our own pace and created our onw individual Scratch projects. Projects ranged from animations, to stories, games and music. After this exploratory start, we will continue with Scratch coding exercises next week. Our wonderful and much loved Go Girl project team member and researcher, Paige, who is a DPhil student at the Oxford Internet Institute (OII), University of Oxford, has been taken seriously ill while conducting fieldwork in the US. 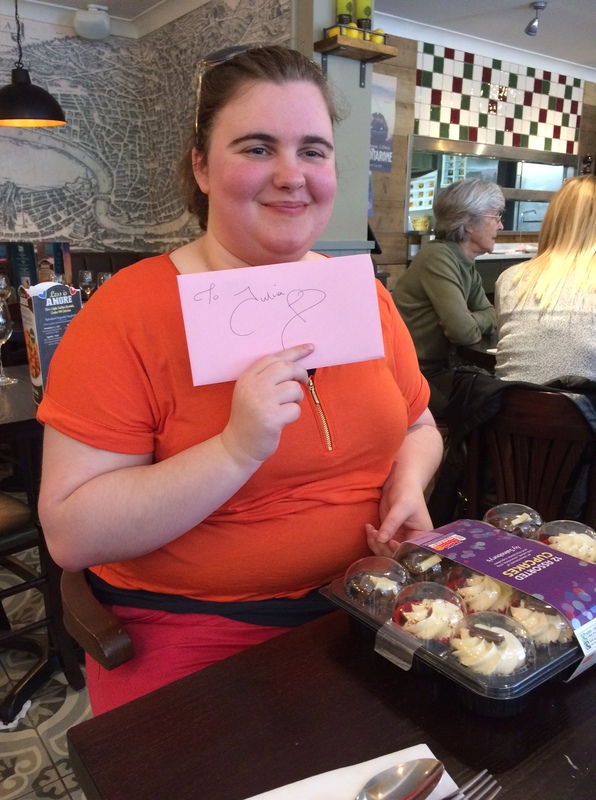 Two of her colleagues at the OII have set up a fundraising appeal to support Paige in covering the costs of her treatment. At Go Girl, we wholeheartedly endorse this appeal. We are also planning a fundraising activity at Go Girl to contribute to the appeal. Please watch this space for more information and updates about the activity! Today, the Go Girl project was showcased at the Oxfordshire County Council’s CEIAG Conferece (which stands for Careers, Education, Information, Advice, Guidance, if I am not mistaken!) at King’s Centre in Botley! 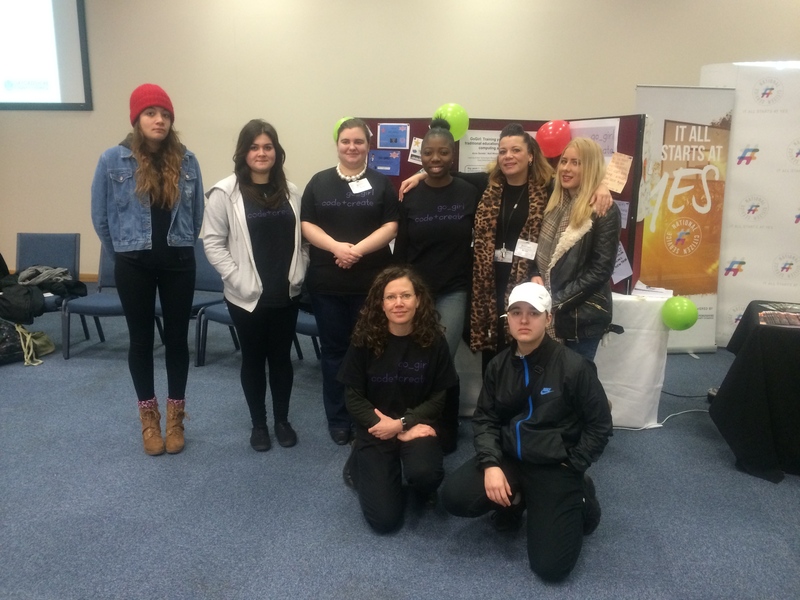 It was a very interesting event and the Go Girls did a fantastic job talking to other exhibitors about their projects and sharing their experiences of taking part in the project. It was great to see everyone back after last week’s mid-term break! 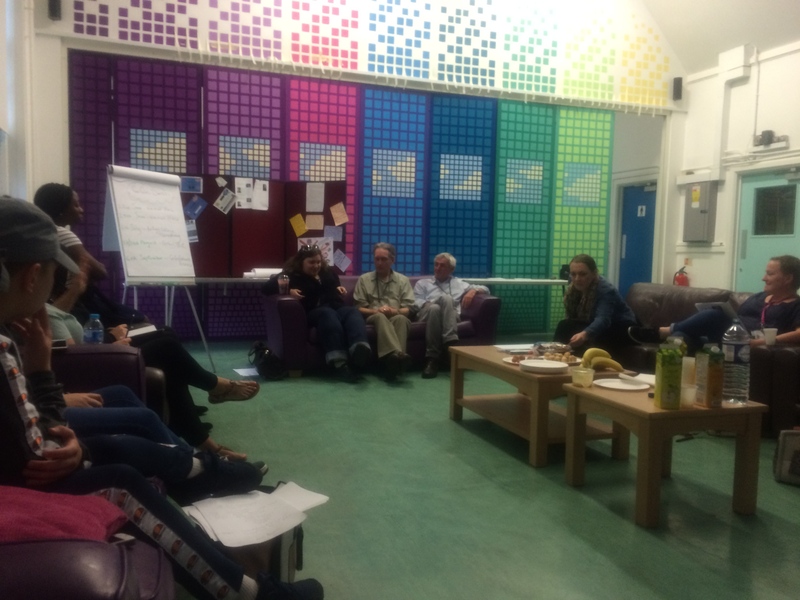 Today, nearly everyone was able to attend and we started the session with discussing what we need to prepare for tomorrow’s CEIAG Conference at King’s Centre in Botley. We wrote down quotes about our experiences of being part of the Go Girl project, which we put up on the pin wall panels that we will use tomorrow to showcase the project. We also decorated the panels for our stall at the conference with posters and logos. We are excited to see how it goes tomorrow! 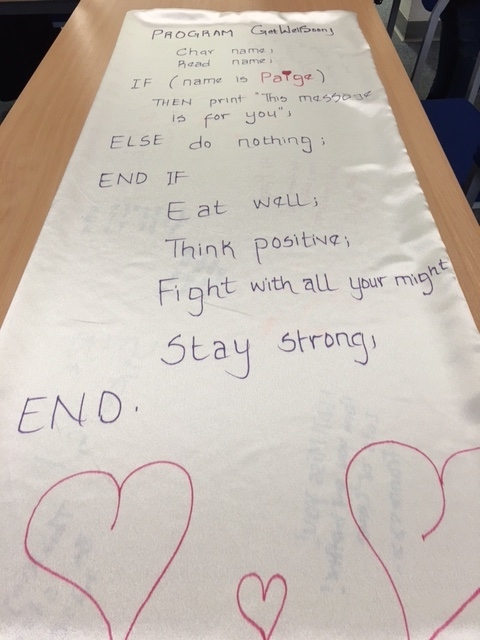 We then moved on to a creative design exercise, in which we developed a GetWellSoon pseudocode that we then printed onto a silk scarf for Paige. It was a very busy session with lots to do today, but everyone chipped in and worked really hard to get everything done by the end of the two hours, and stayed focused throughout! Next week we will will continue with our introduction to Scratch on our iPads and on the PCs, before we start with the development of our own mobile phone and iPad apps. 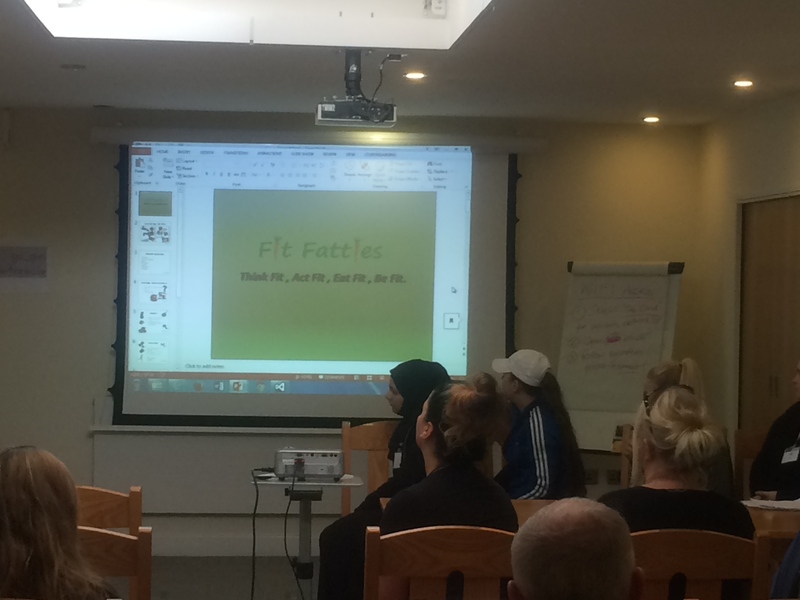 The group session kicked off with the girls discussing the previous week talking about other projects and programmes they are currently involved in; including training and employment seeking. Today the group took part in coding with plastic cups- we got into small groups and had to work from the coding worksheets. We had to write instructions in order to build pyramids with the plastic cups. Each group had a coder(write instructions) and a robot (instructed to stack cups). We also had a visit from Janpreet who is a student from the Department of Computer Science. She spoke with the group about her challenges of being a female and studying Computer Science. Talking about her own personal experiences with colleagues and difficulties faced being a woman interested in studying Mathematics, Science and Spanish. Janpreet was inspirational in terms of empowering the young women to think about equality and following their ambition regardless of gender. Once everyone arrived, we had our weekly check-in and recaps from the previous week. 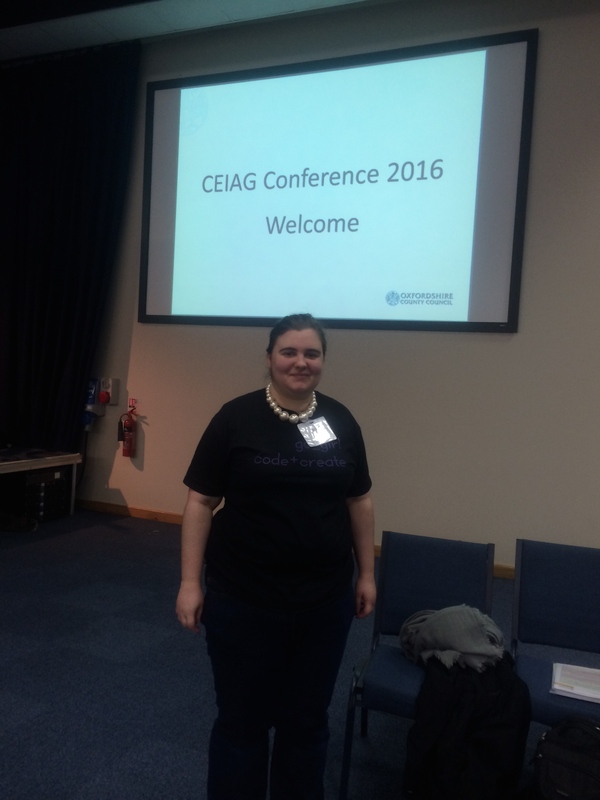 Lita Thornhill and Luke Mattam, representatives of the Oxfordshire CEIAG (Careers Education, Information, Advice and Guidance) conference 2016 joined us to briefly discuss what and who to expect at the conference taking place on the 25th of February, 2016 at the Kings Centre, Oxford. The go_girls would be exhibiting their projects from several activities done in the past including the digital wildfire project. The conference would be an opportunity for the girls to network and interact with educators and career advisers. Building on the knowledge of pseudo codes and program instructions from our previous sessions, we decided to carry out the Thinkersmith’s traveling circuit robotics game using symbols and then coding our symbol instructions into pseudo codes. Paula coordinated this exercise, pairing us into groups. Each group had a coder who wrote the instructions and a “robot” friend or partner who had to execute the sequence of symbol instructions.These symbols instructed the robot on how to stack some plastic cups placed in its presence. The main goal of this exercise was to highlight programming techniques. Our symbol instructions started with a program name “PROGRAM CupStackPyramid” and the keyword “start”. Each instruction ended with a semicolon “;” and the keyword “stop”. We learnt how to convert real-world activities into instructions and the need for precision while coding. After practicing robotics with symbols and plastic cups, Niall led the attempt to convert our symbol instructions to pseudo codes using the “While -Do -End While” looping structure for the repetitive actions our robots needed to execute. We were low in attendance but managed to have fun with the small group. Next session, we would complete the pseudo code writing for our robots and sign up with Scratch so we can start writing executable computer codes. Today nearly everyone was back. After the usual weekly check-in, we started the session by taking a group picture of us in our go_girl: code+create T-shirts (Shannon, Sabbah, Jess and Anne are missing in the picture). After a quick re-cap of last week’s session about women in coding and why coding matters by Paula and Paige, we watched a short video clip about Ada Lovelace and Charles Babbage, which was very informative. We were all surprised about the size of their Difference Engine! 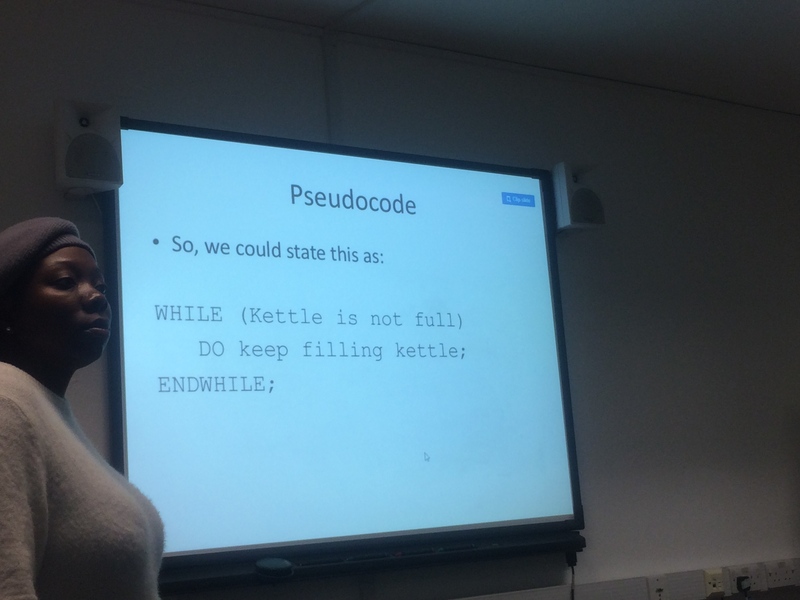 Niall then explained the basic principles of programming again, which he had introduced in last week’s session through Pseudocode, using the example of the program ‘MakeACupOfTea’. We learned through this example how to write a program, using sequence (PROGRAM, END. ), selection (through the example of adding sugar or not to the tea using IF, THEN / ELSE, ENDIF;), iterations (WHILE, DO, ENDWHILE;) and loops. Each of us then went on to design a Pseudocode program of our own choice, trying to apply these principles to our algorithms. We came up with Pseudocode programs such as ‘SetUpAMobilePhone’, ‘ApplyEyeMakeUp’, ‘ListenToSongOnIPad’, ‘UseHairStraighteners’, ‘BrushYourHair’, ‘MakeAToast’, and ‘ApplyFaceFoundation’. We then presented our programs to the group. It was a great activity that made us understand how important it is to provide very detailed and specific instructions at each step of a program. Time went by quickly, and we finished the session by applying the principles we had learned to Python by completing the Python Introduction exercises on Udacity, which we had begun last week. Next week, we will start with a ‘pen & paper’ coding game using plastic cups, and Paula will also bring along a ‘real’ program for us to have a look at and explore together. We will also complete a few more exercises in Python.